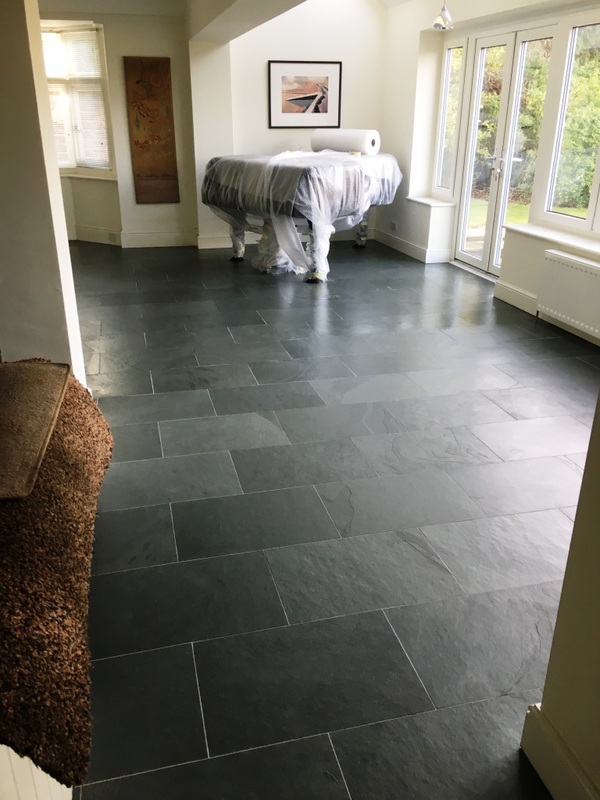 This was a very large natural slate floor installed throughout much of the ground floor at a property in East Surrey town of Oxted. 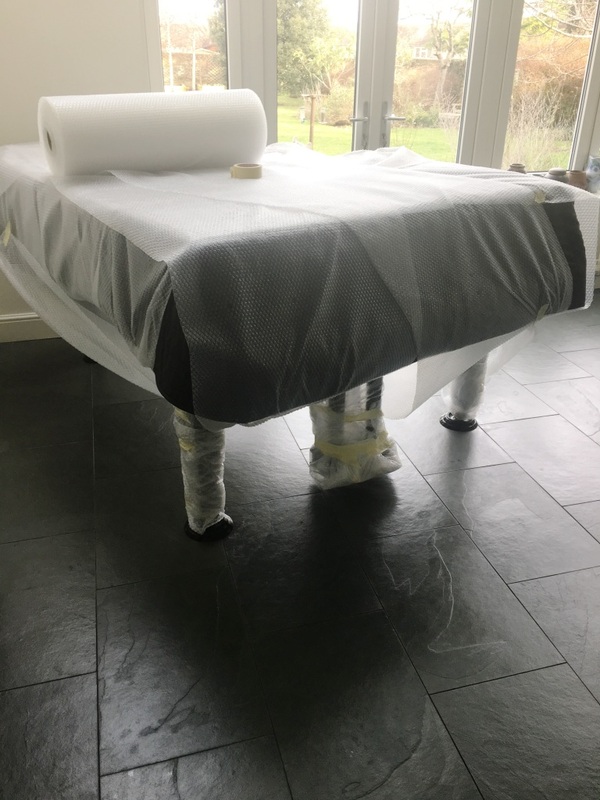 The owner was unhappy with the state of the tiles and especially the grout however she wanted to ensure I would take maximum care around her Baby Grand piano. 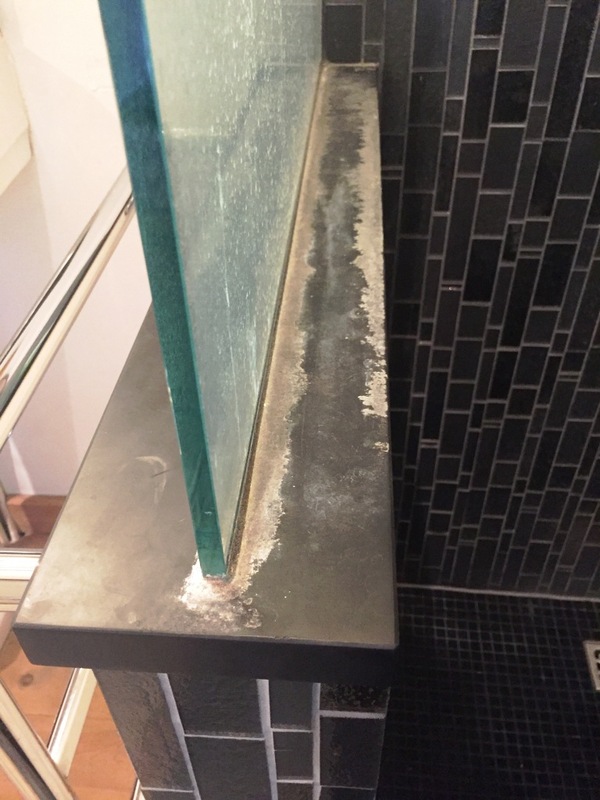 If you have read any of my previous articles you will know I am careful and take time to protect anything that could be stained or damaged with a non-marking film. 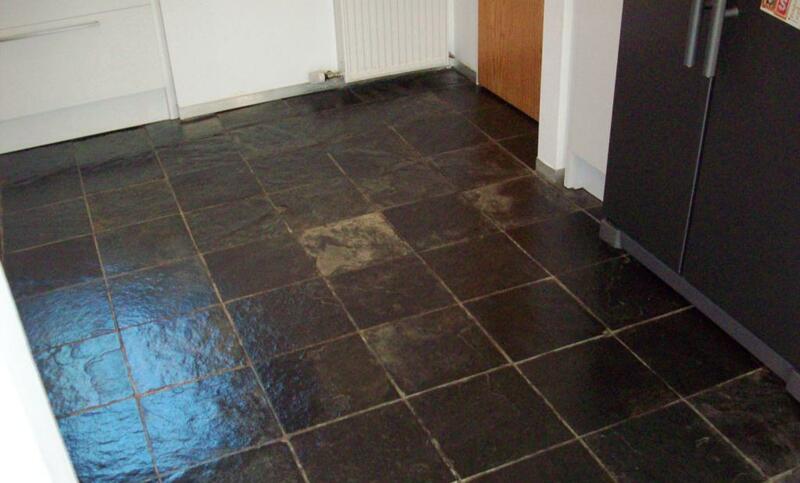 I therefore assured her I would take maximum care in her home and that it wouldn’t be a problem. 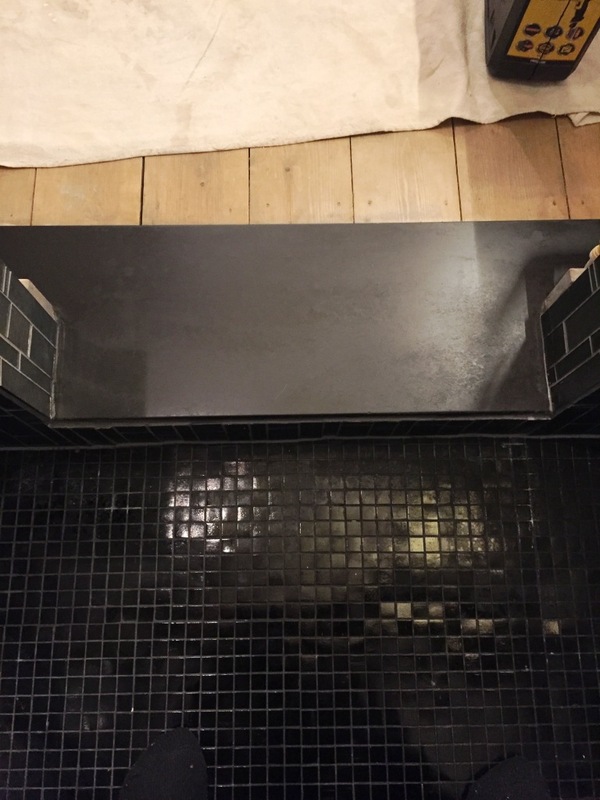 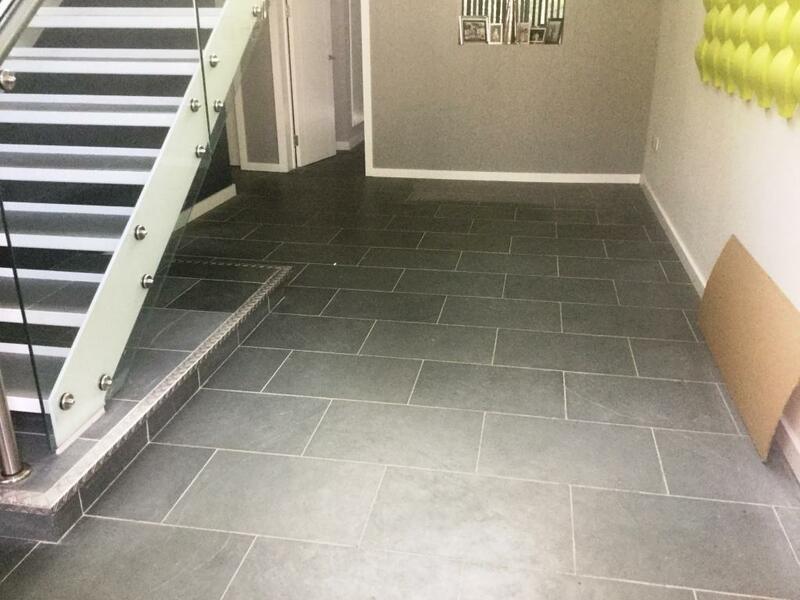 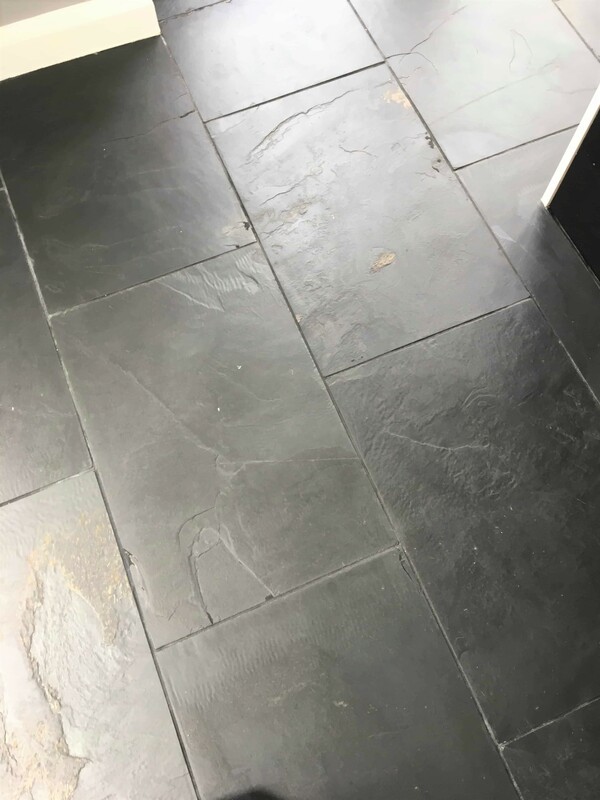 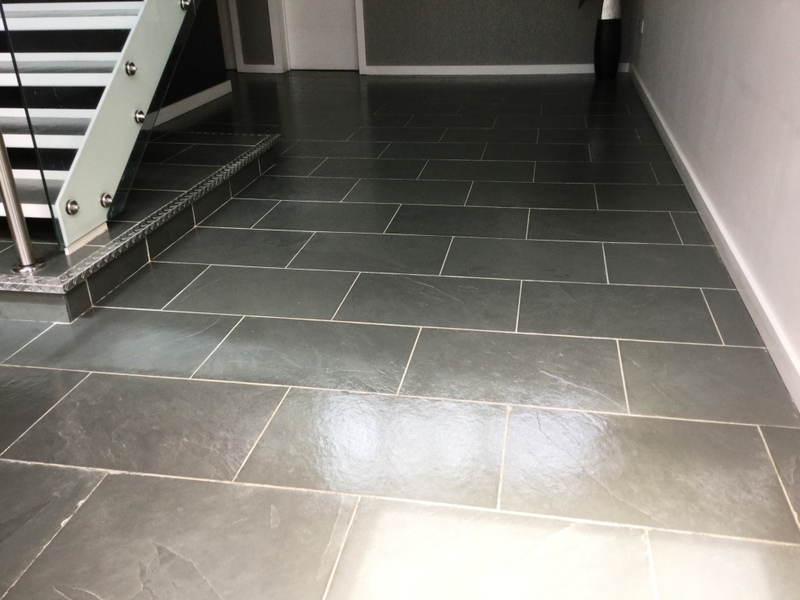 A client of ours recently moved into a relatively new property in the town of Blackwood where the black slate floor looked dull and the grout was stained. 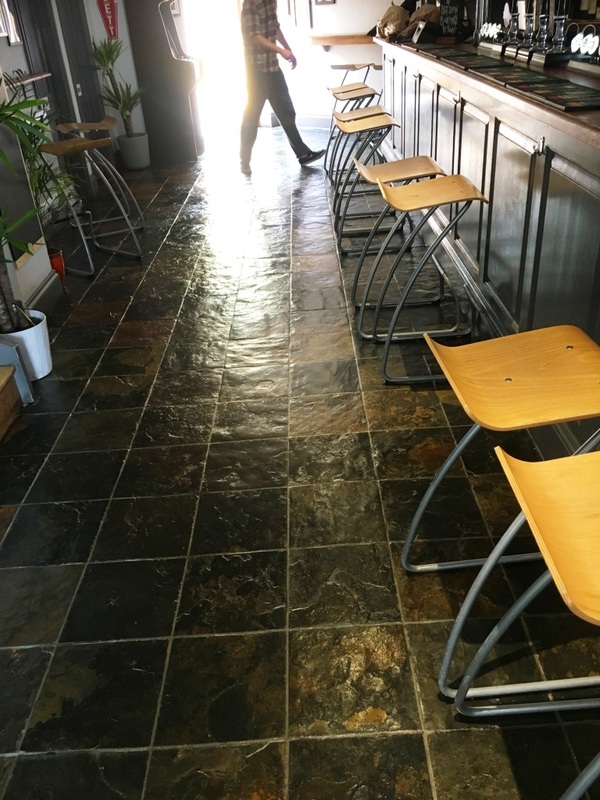 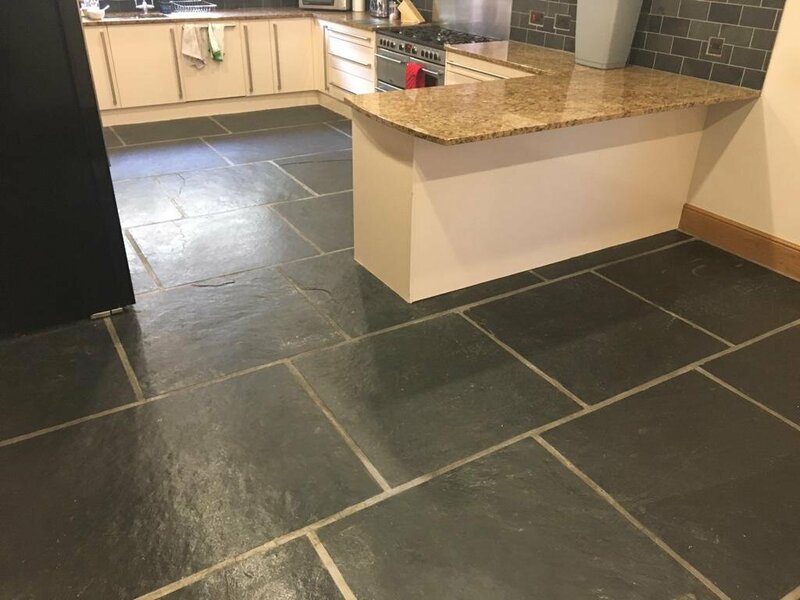 Large format slate tiles were installed though the kitchen and adjacent dining and utility room and they were keen to see if the floor could be brought back to life. 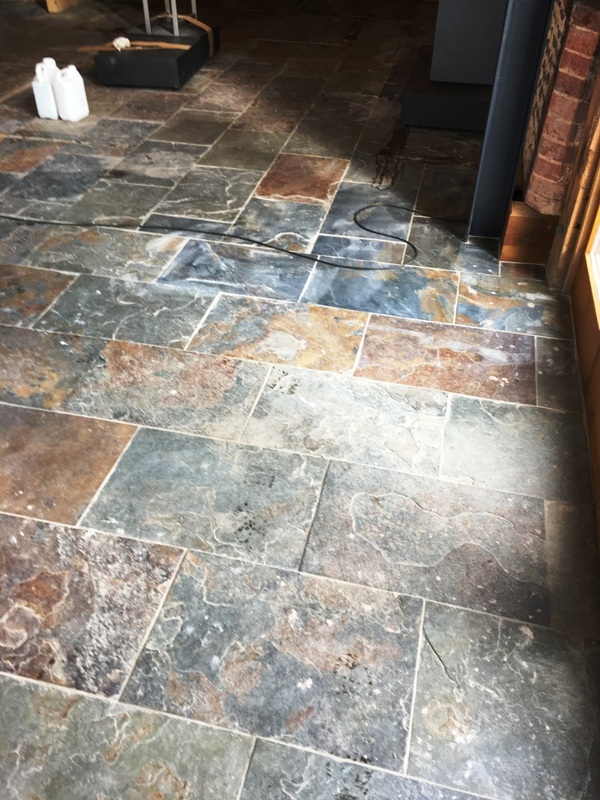 I went over to survey the floor and could see that the old sealer was failing and letting dirt into the pores of the stone which was especially notable in the busier parts of the floor which had seen the most foot traffic. 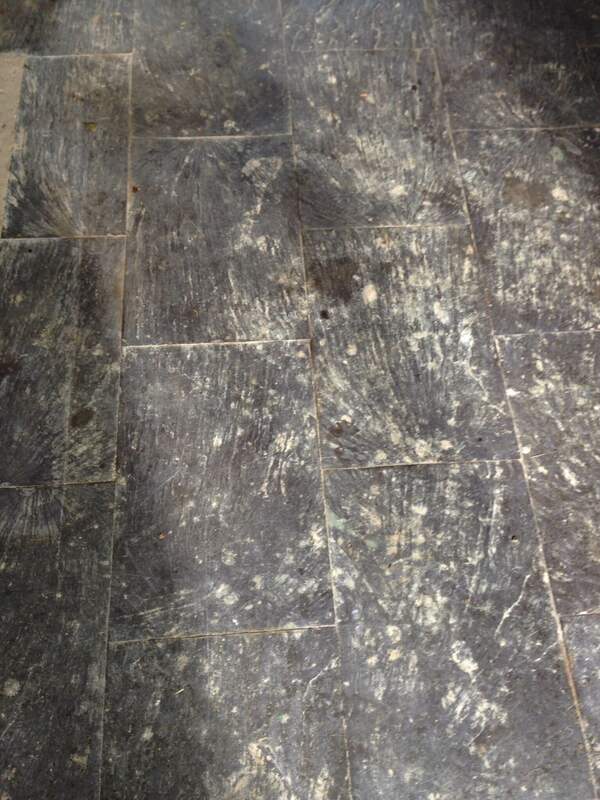 The solution would be to strip the floor of the old sealer, clean up the grout and reseal. 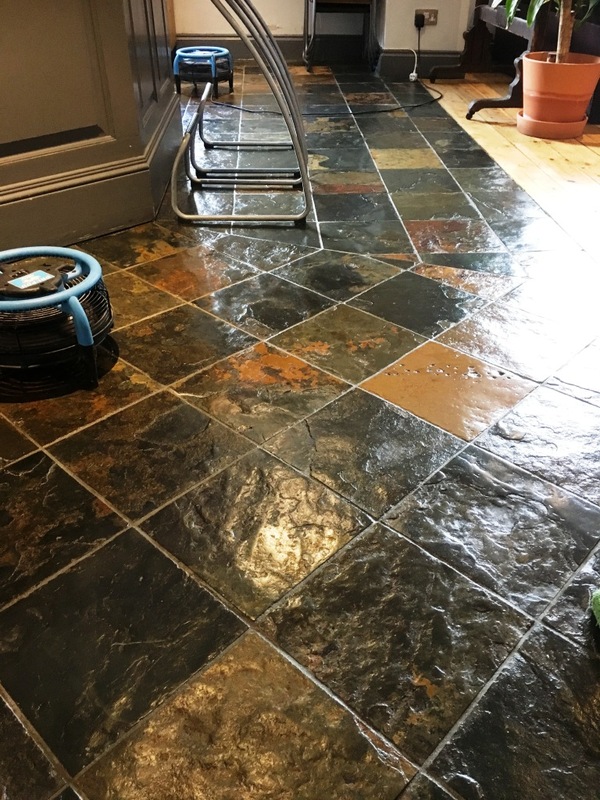 I conducted a number of test cleans to work out the best way to how best to strip off the old seal and get back down to the natural stone. 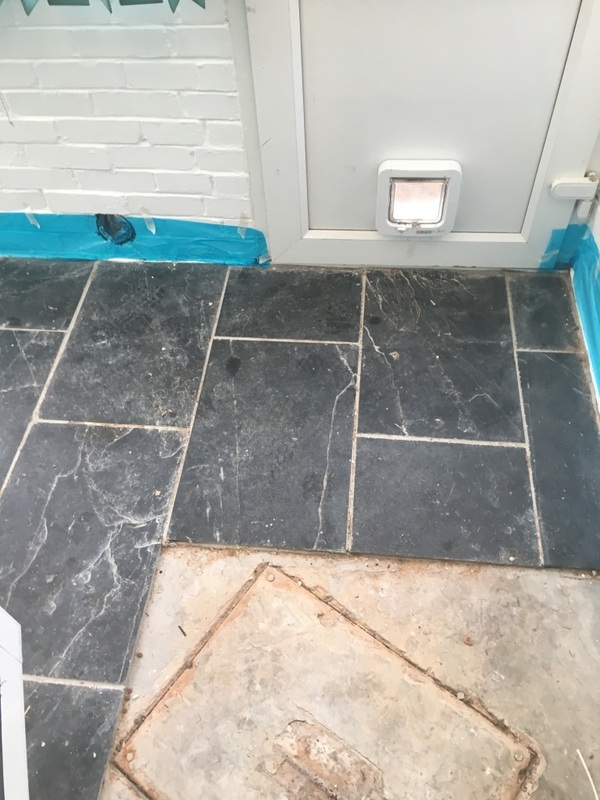 However, as it turns out removing the old sealer was proving to be quite a job and I was concerned that this task alone could potentially take days. 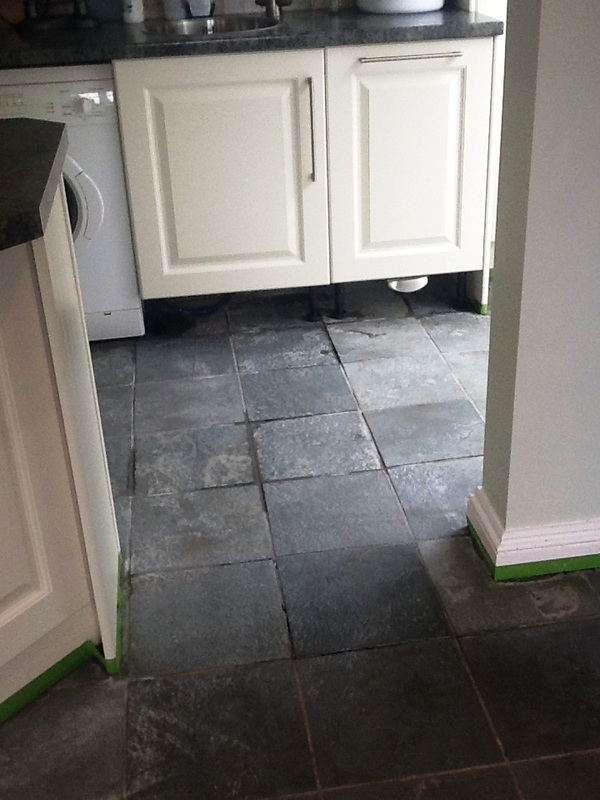 Unhappy with the way things were going I consulted the Tile Doctor help line and we deduced that the sealer applied previously was most likely a heavy duty/industrial product. 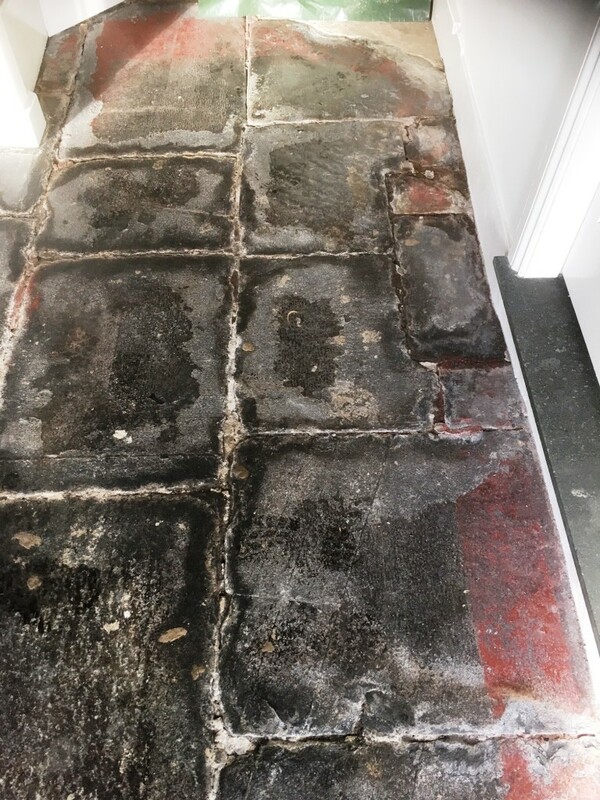 My client had only just moved into the property and didn’t know the history of the floor so couldn’t help pin point what was used before. 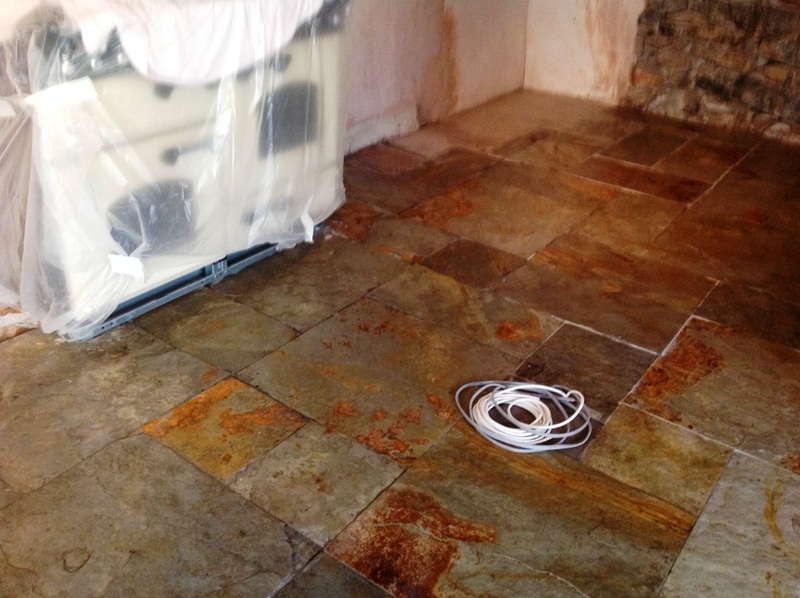 The way forward was to strip the old sealer off the floor using abrasive pads. 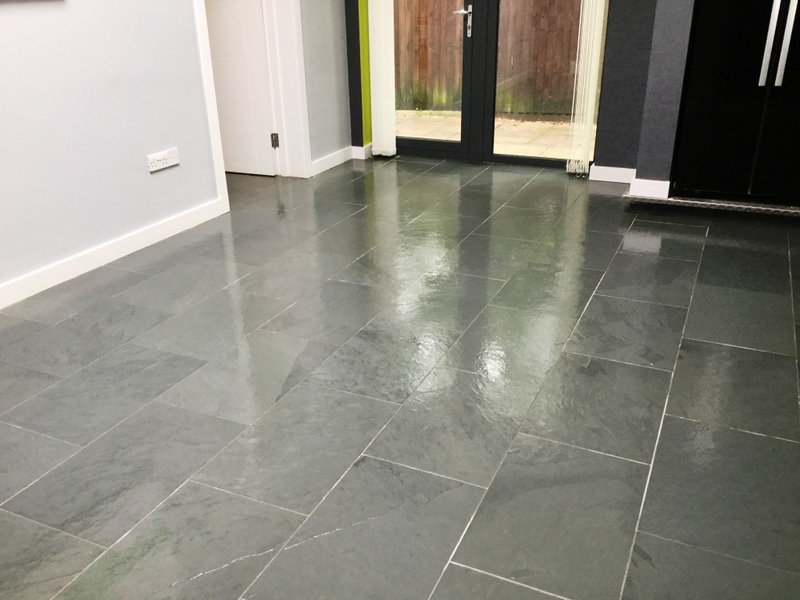 Now I had an efficient strategy for renovating the floor I was able to provide the customer with an accurate quote which was accepted, and we agreed a date to return and complete the floor. 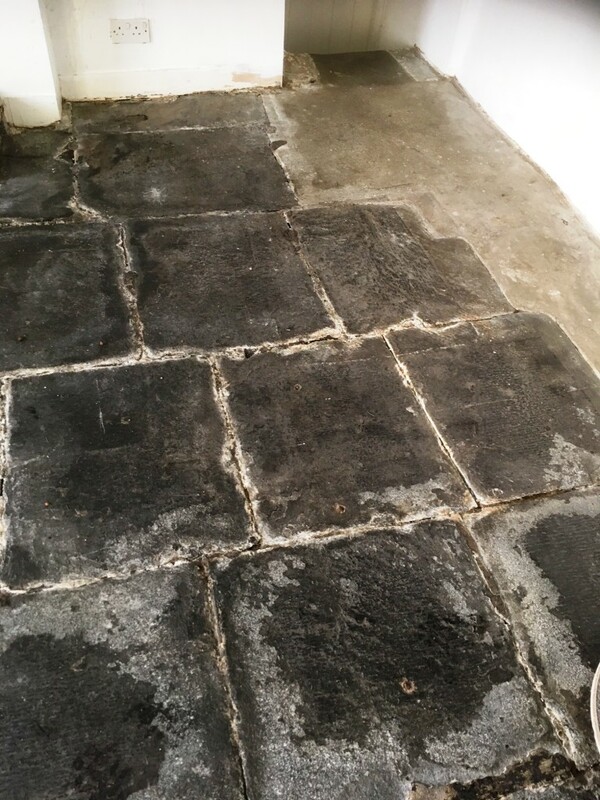 To begin the restoration, I pre-wet the floor with water and using a weighted floor buffer ran a coarse 100-grit milling pad several times across each tile. 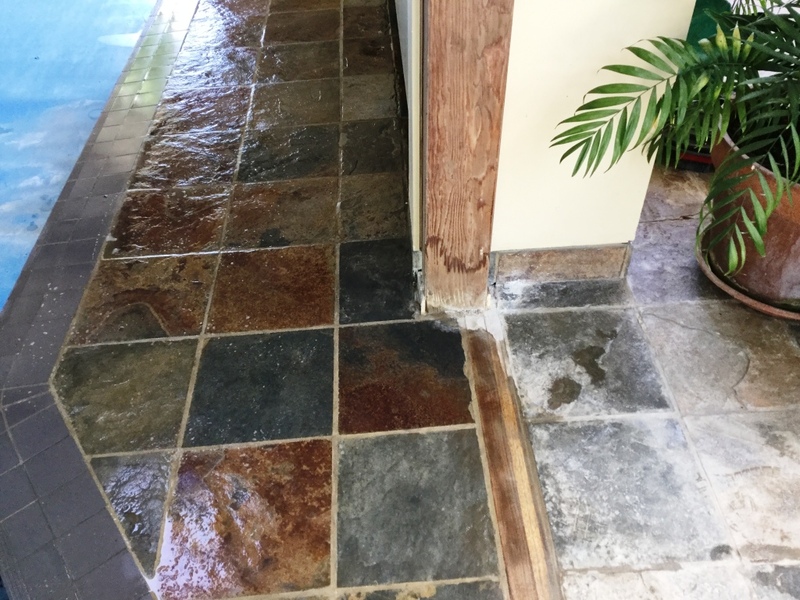 This process strips the dirt and sealer off the stone slowly turning the water into a grey slurry. 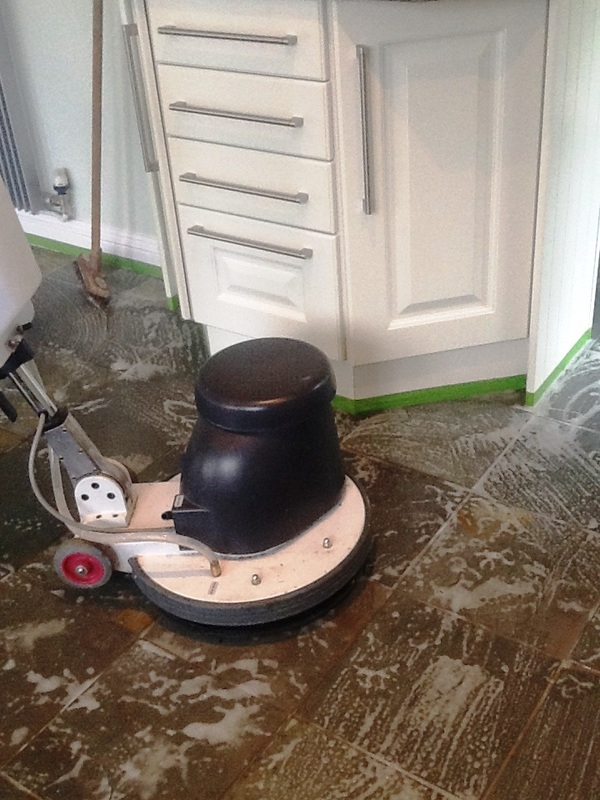 Once the whole floor had been treated in this way, I rinsed the slurry off the floor and extracted it using a wet vacuum. 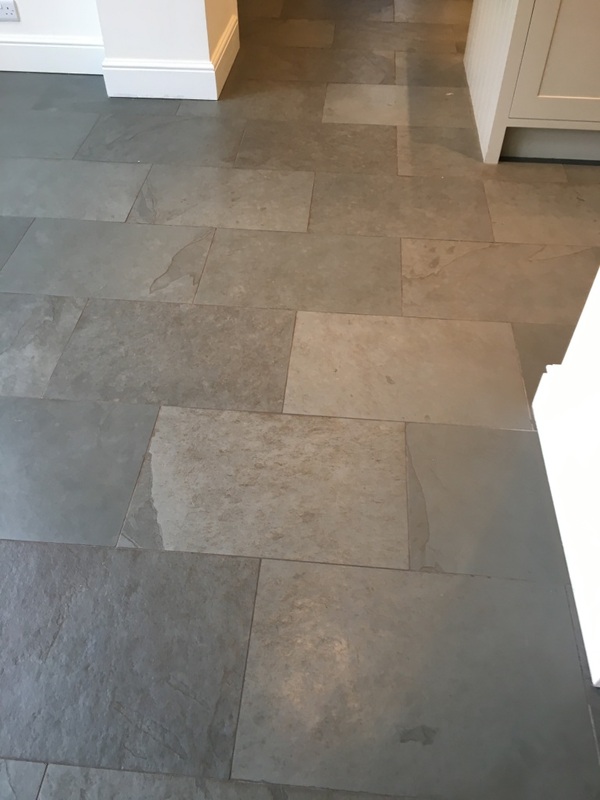 The next step was to repeat the process using a 200-grit burnishing pad which being finer closes the pores in the stone and refines the surface further. 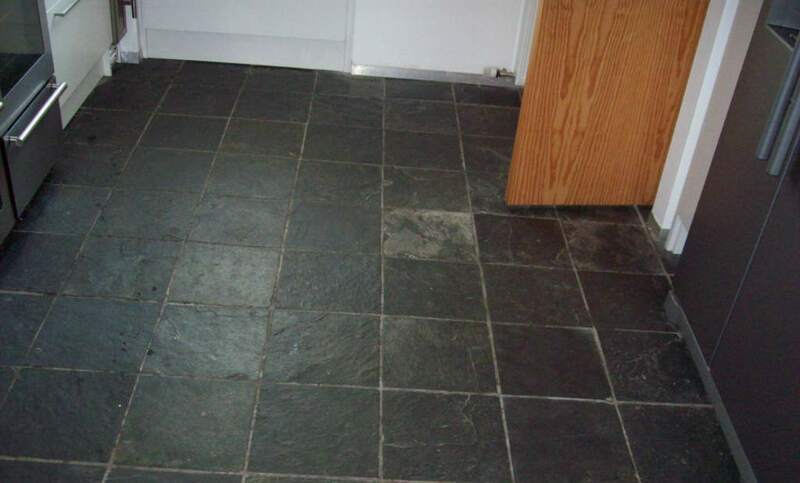 The next step was to clean up the grout using Tile Doctor Pro-Clean which is a strong alkaline cleaner. 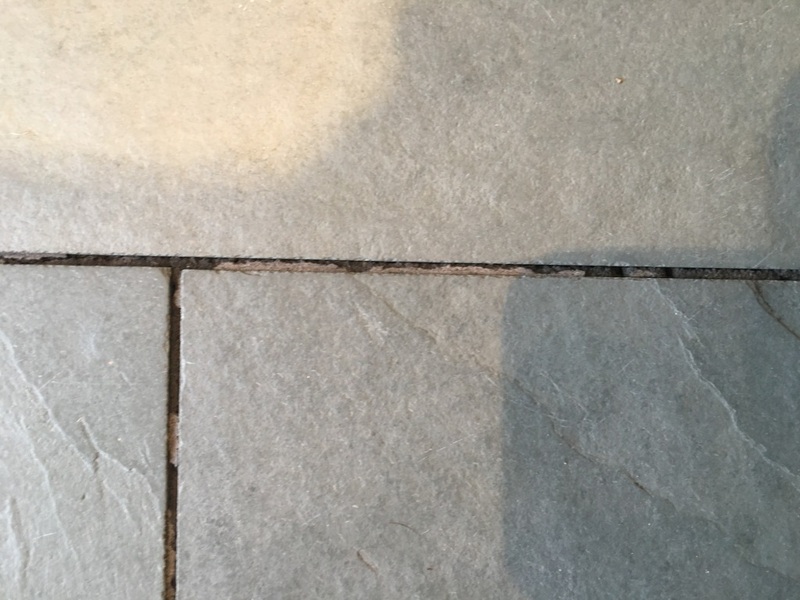 You apply a strong dilution to the grout lines and then scrub it in with a stiff brush. 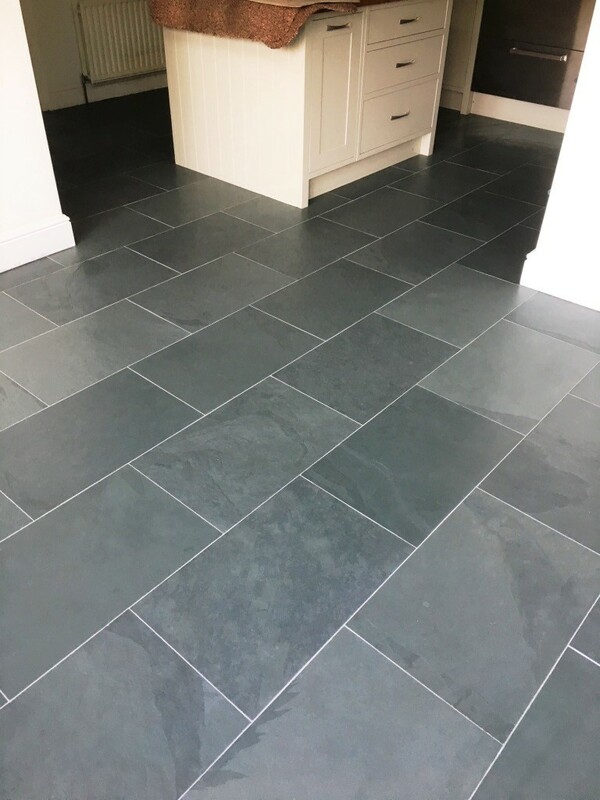 Fortunately, the slate tiles were large format size so there was less grout to deal with than usual. 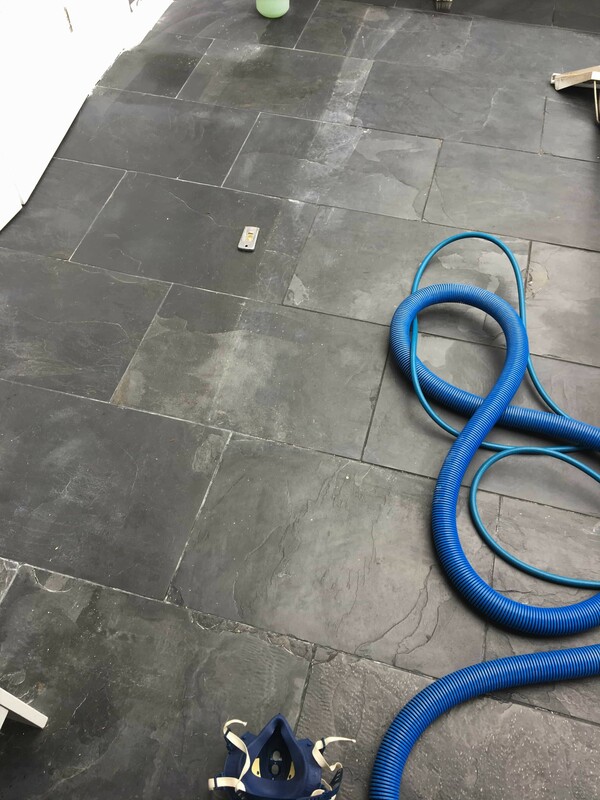 Once that was done the tile and of course grout was rinsed again with more water and then dried again using the wet vacuum. 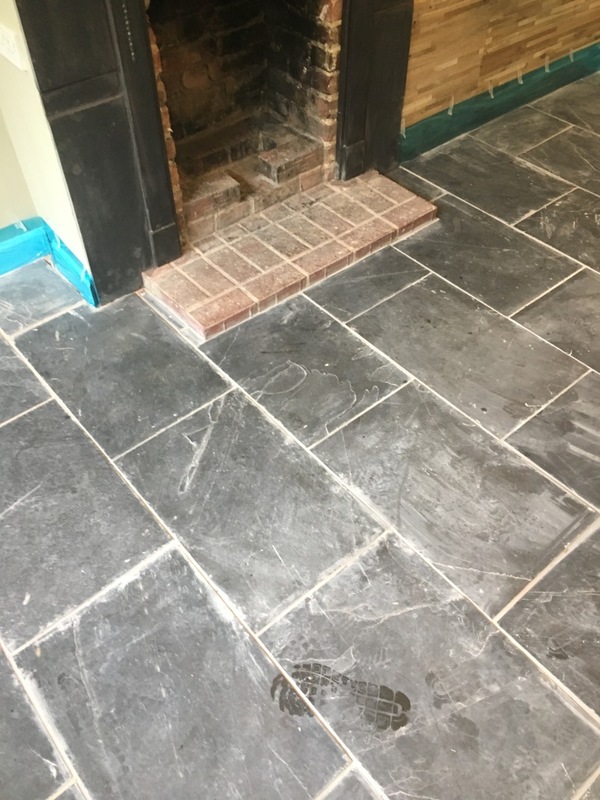 I have to admit the stripped slate looked pretty awful at this stage in the restoration, but we were now back to the natural stone which was clean and free of all sealers. 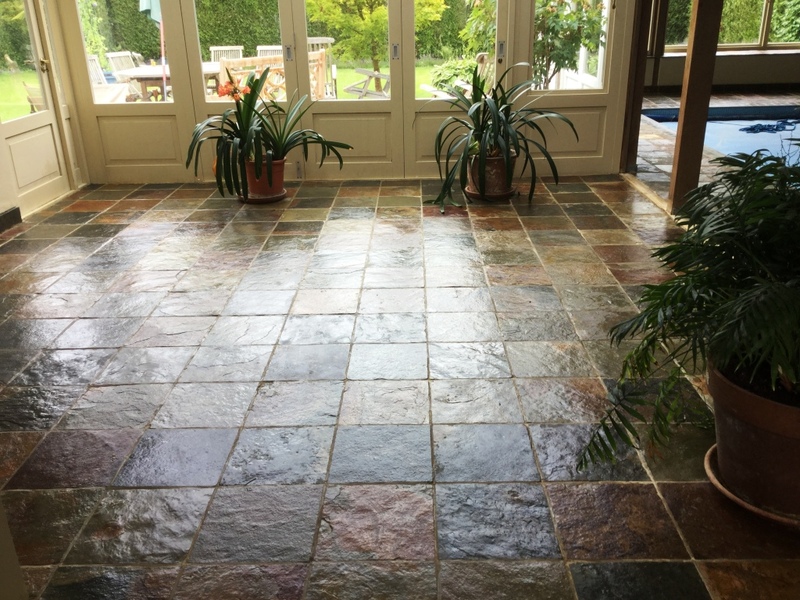 I left the floor to dry off fully overnight confident in the knowledge that with the application of a fresh sealer it would look a lot different. 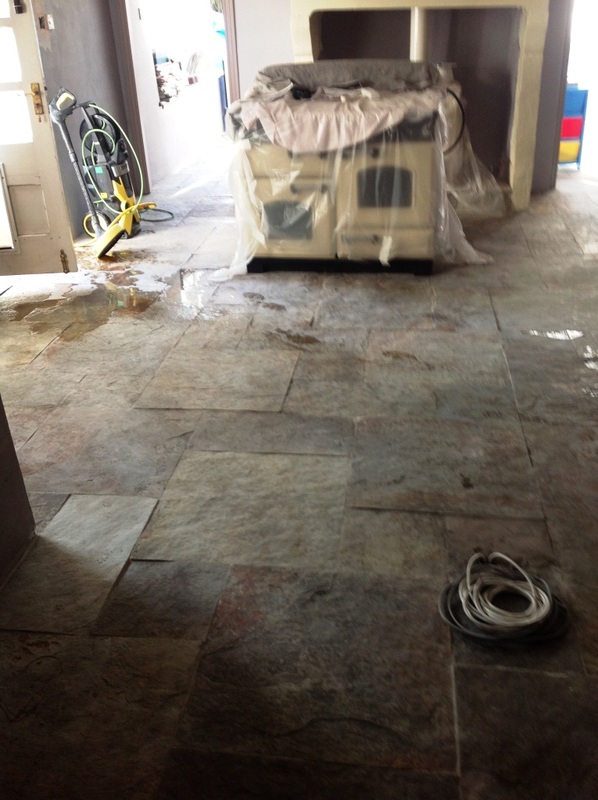 The next day I returned to the property to seal the floor. 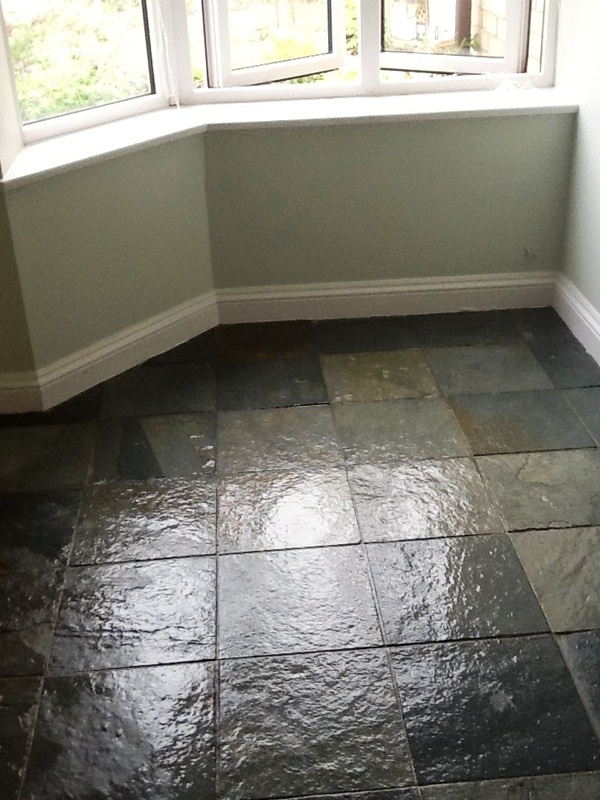 Before doing so, however, I needed to test the Slate for moisture as you shouldn’t apply a sealer to a damp floor. 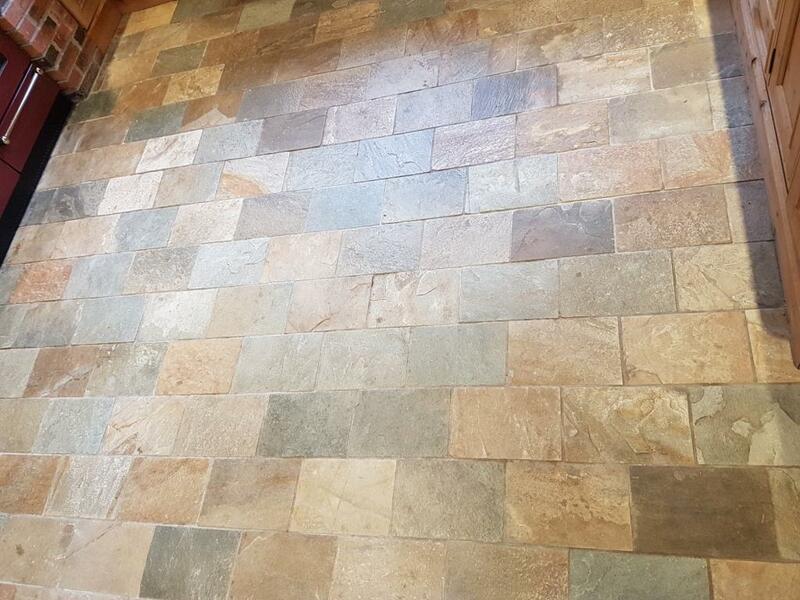 The results were fine, so I proceeded to apply the sealer which for this installation I used several coats of Tile Doctor Seal and Go. 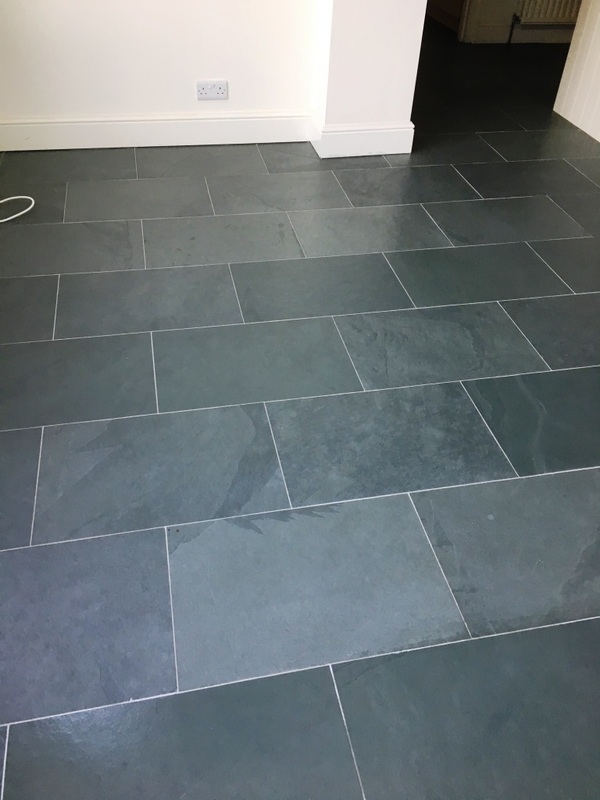 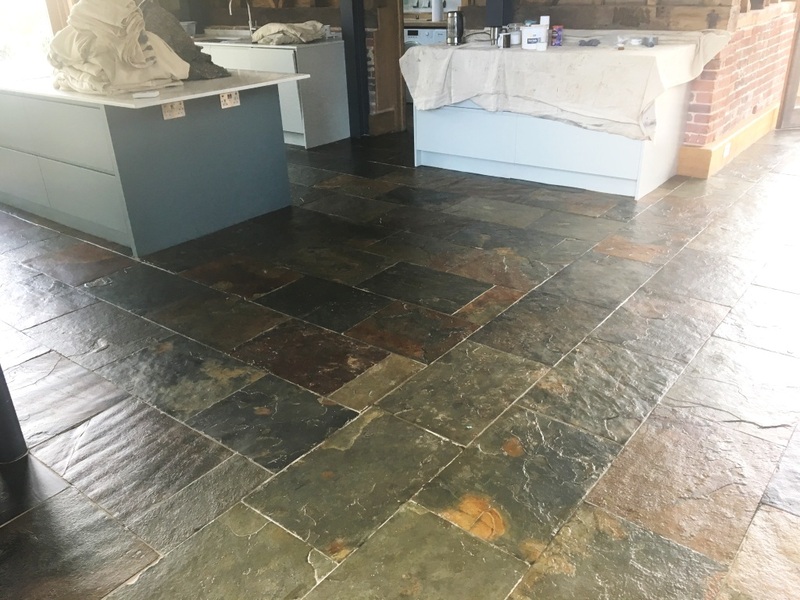 I chose Seal and Go for this floor as it works well on Slate resulting in a deep durable satin finish that the customer wanted. 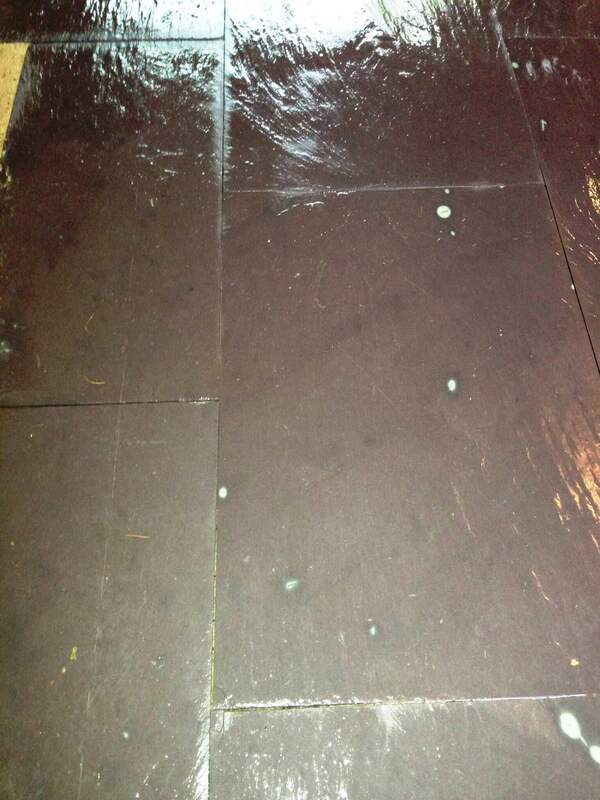 Additionally, being a water-based product, it doesn’t leave a smell as it dries. 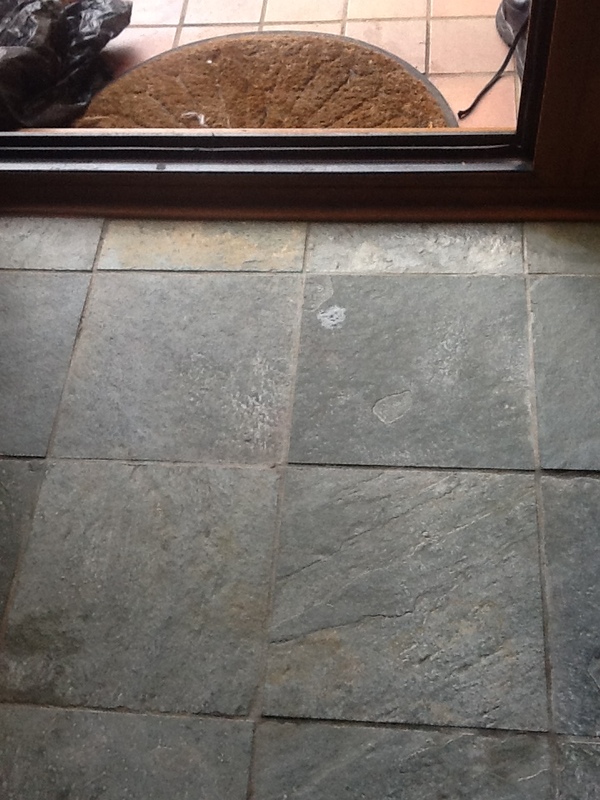 Within two days the floor was transformed, the grout looked much cleaner and the stone looked new. 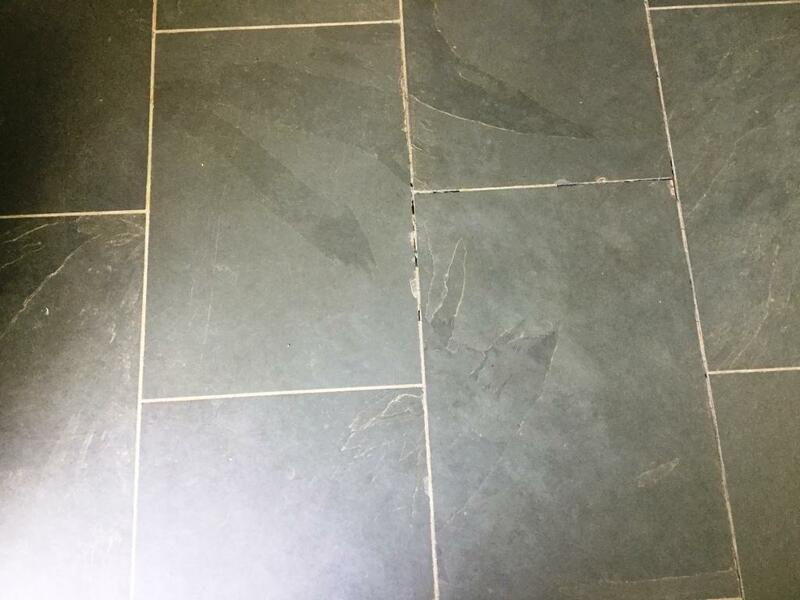 My client was very happy with the work and left the following message on the Tile Doctor feedback system. 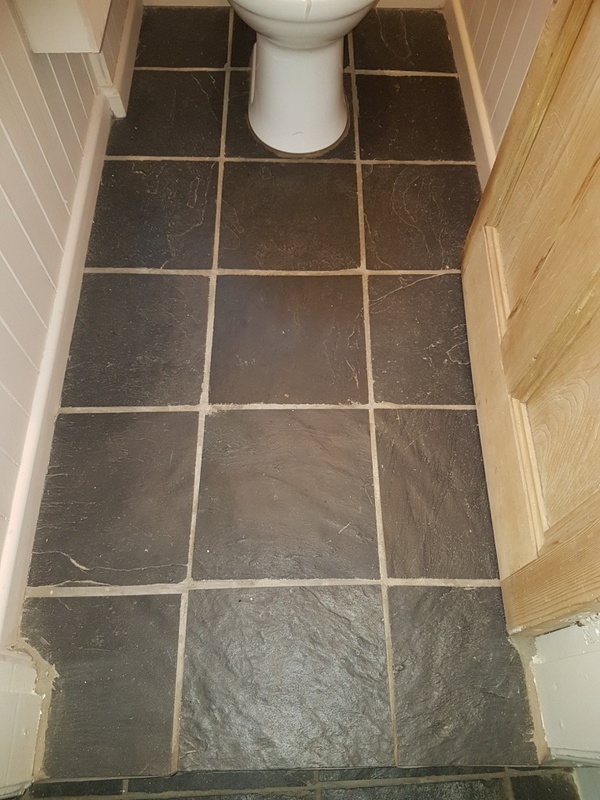 Professional, polite and courteous. 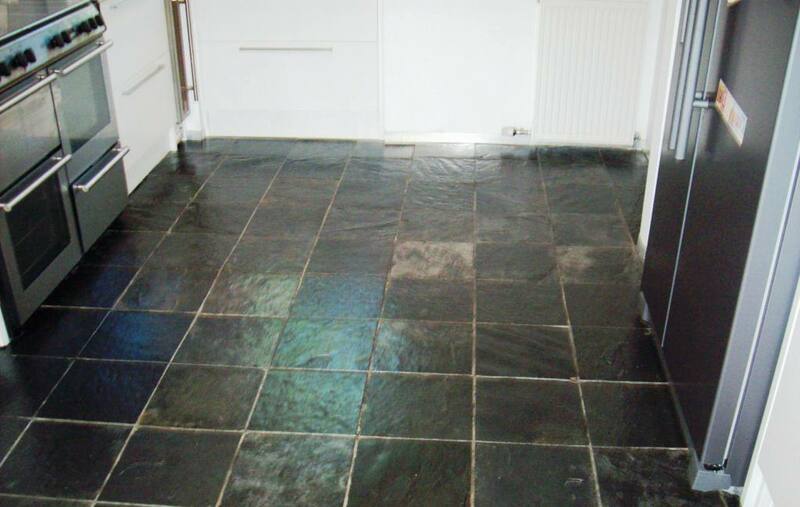 Paul went beyond the call of duty to help rejuvenate our slate tiled kitchen and utility room floor. 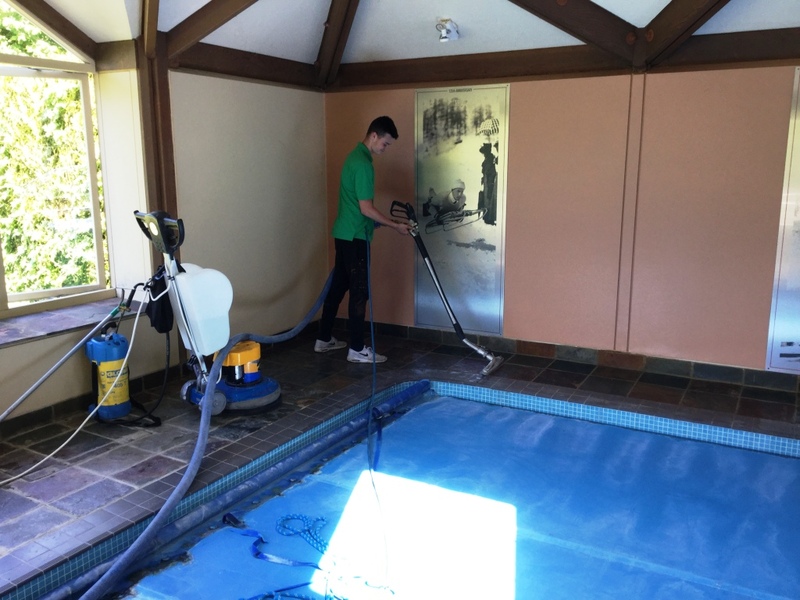 He explained each step of the job and provided advice on aftercare and future maintenance. 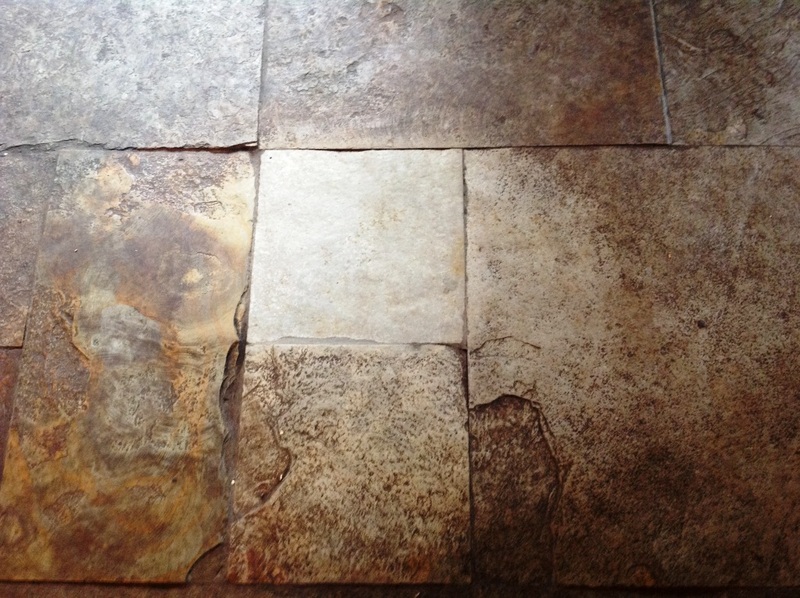 The results are great and I would gladly recommend the services available. 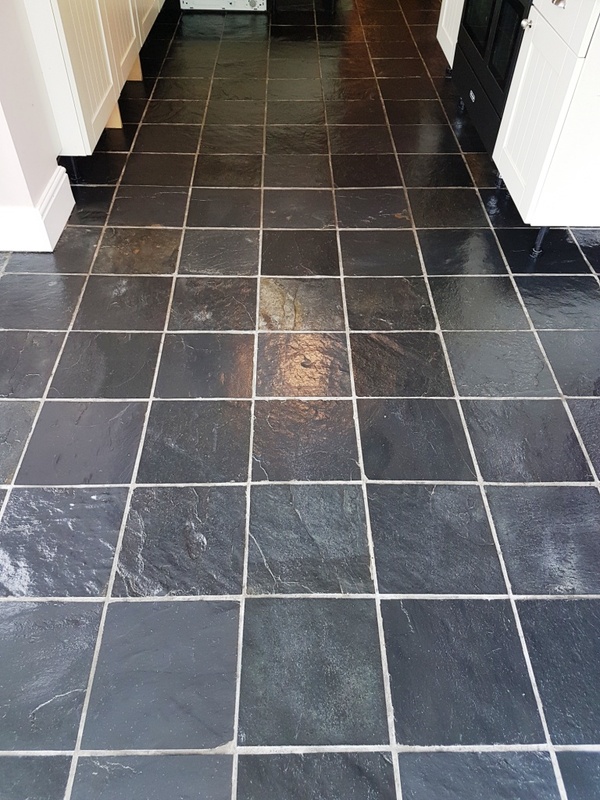 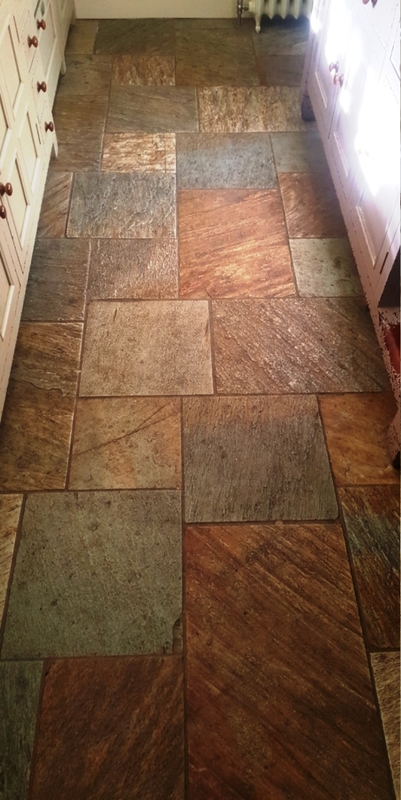 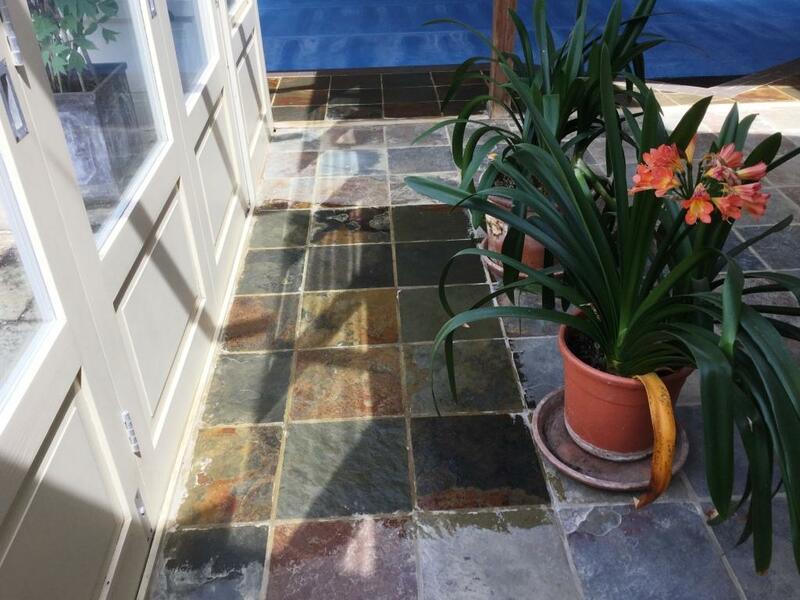 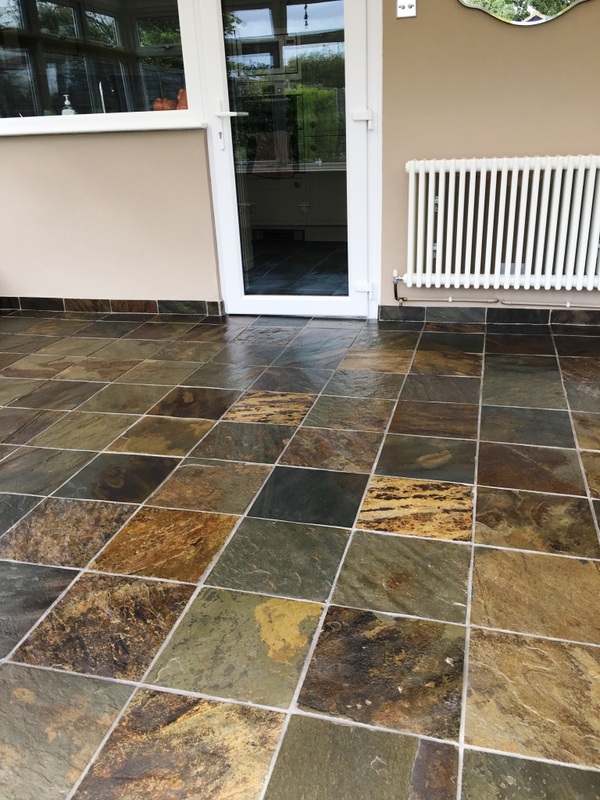 This post comes from a lovely house in Ticknall, Derbyshire where the owner had installed a Welsh Slate Tiled Floor in their Kitchen ten years earlier. 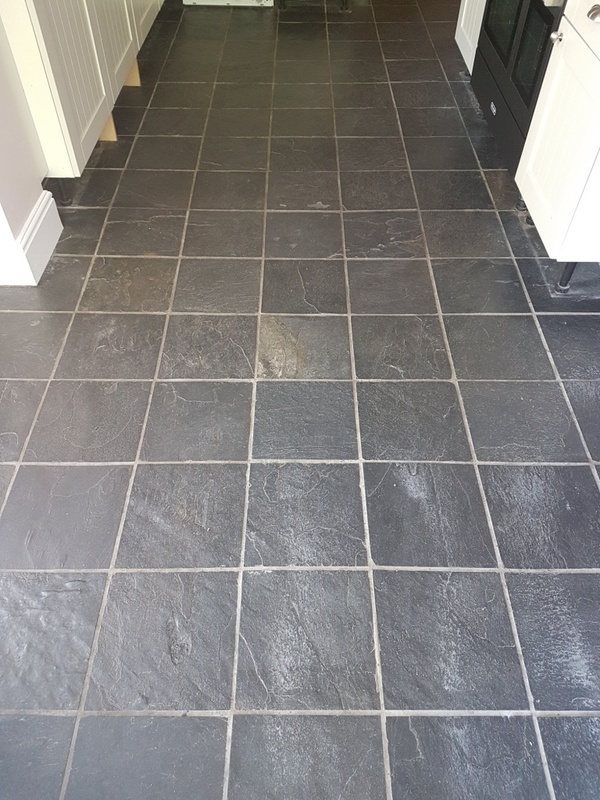 Welsh Slate is renowned the world over for its quality however ten years of use in a high traffic does take its toll and the customer complained that she wanted the tiles to look colourful with a matt finish but they always looked dull and dirty even after cleaning with mop. 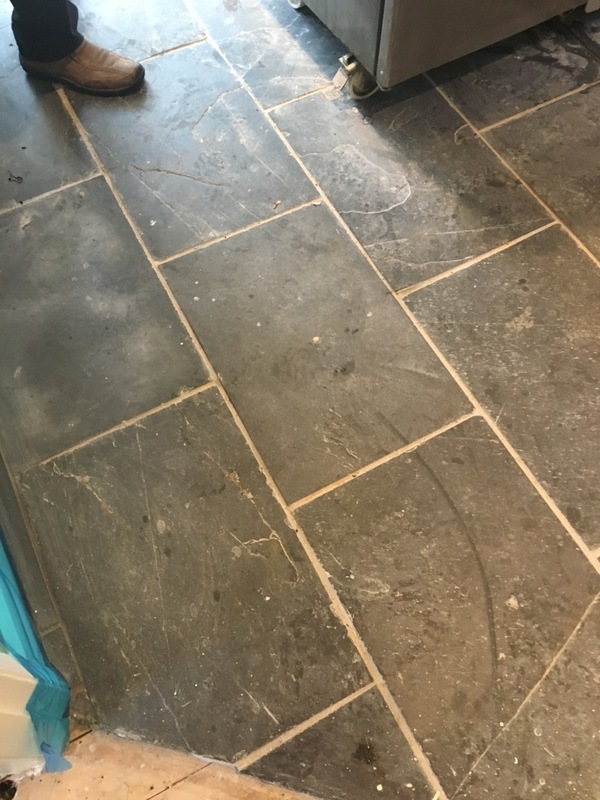 Interested to know the history of the floor I asked when it was last sealed and apparently it had not been redone since it was installed. 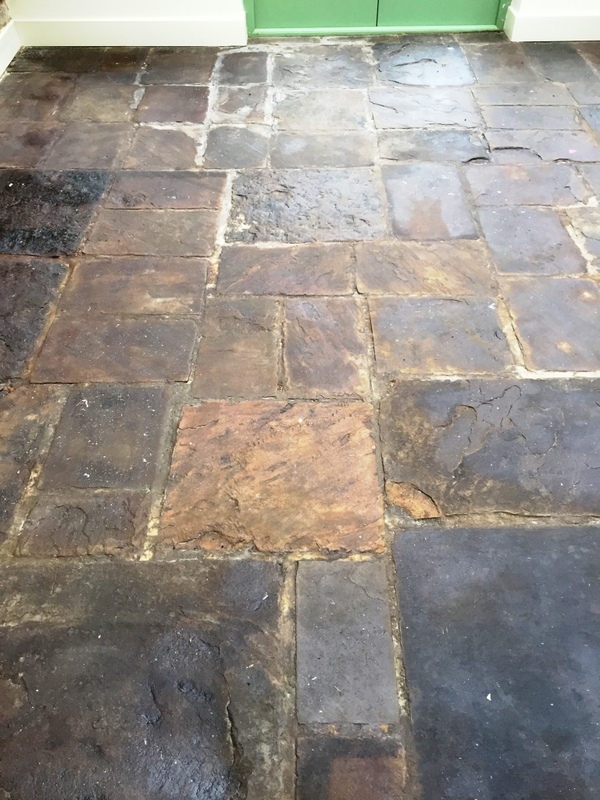 It was clear to me that any sealer had long since long worn off and now dirt was becoming trapped in the pores of the stone making it difficult to clean effectively. 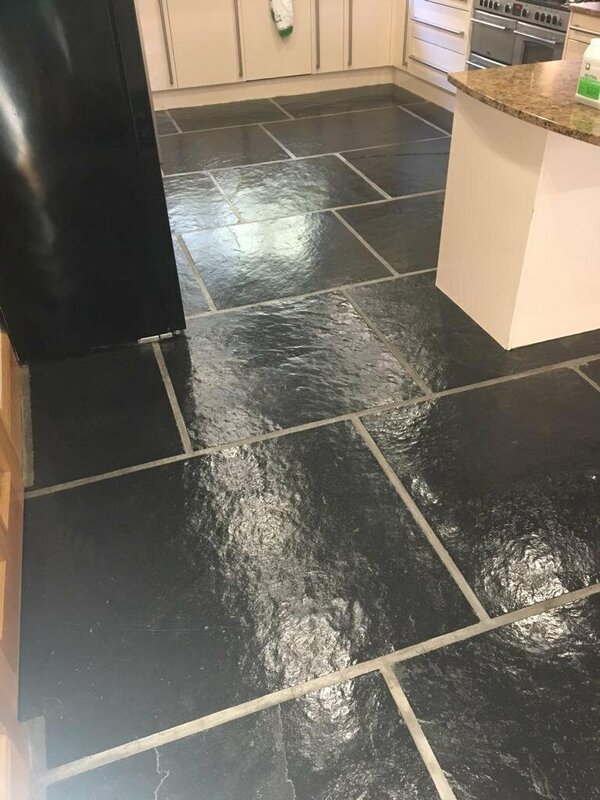 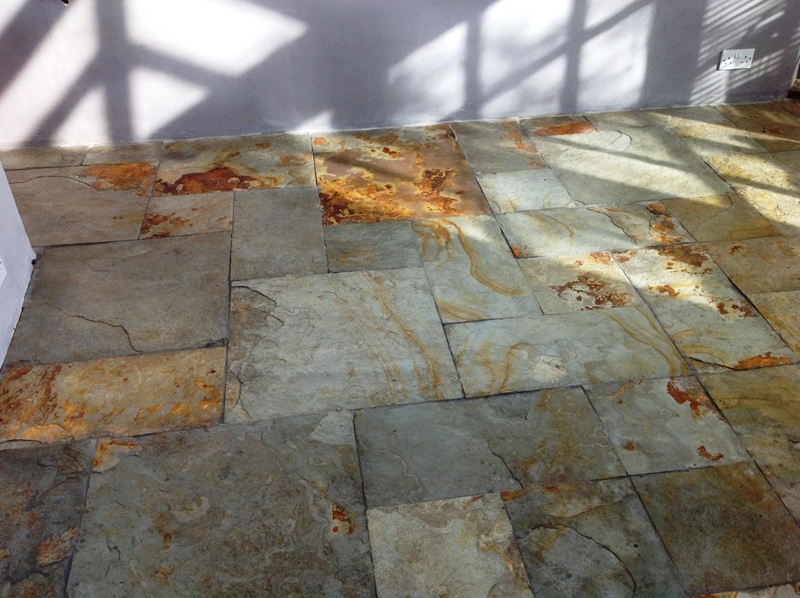 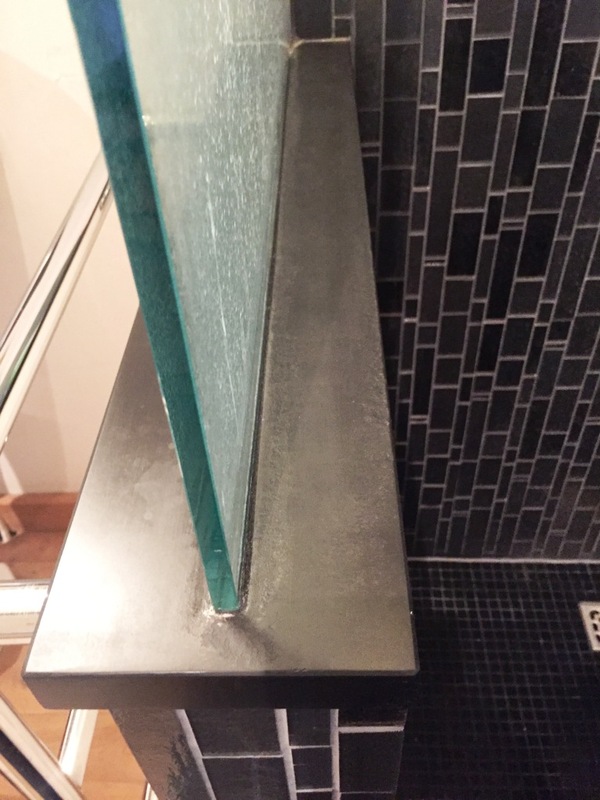 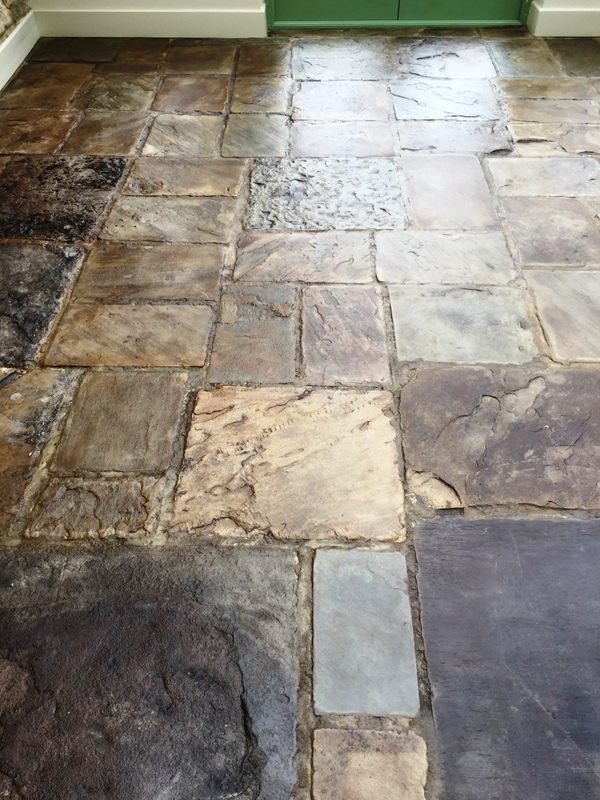 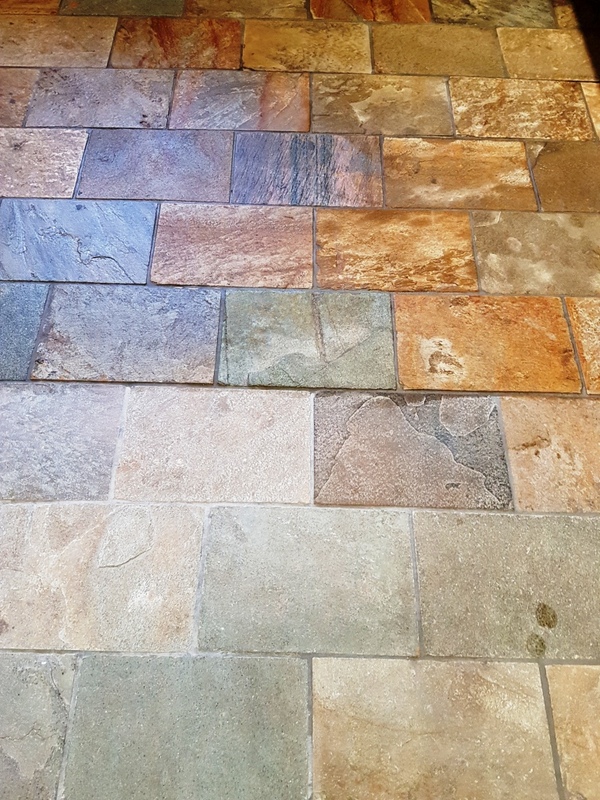 To get the Slate clean I applied a strong dilution of Tile Doctor Pro-Clean which as well as cleaning deep into the pores of the tile should also deal with any remaining sealer. 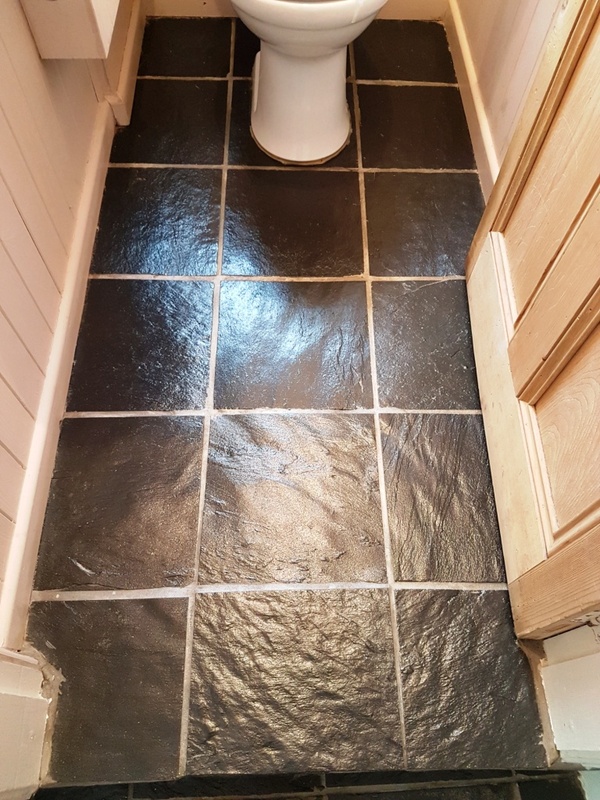 I left it to soak into the tile for about ten minutes before working it in with a black scrubbing pad fitted to a rotary buffer machine. 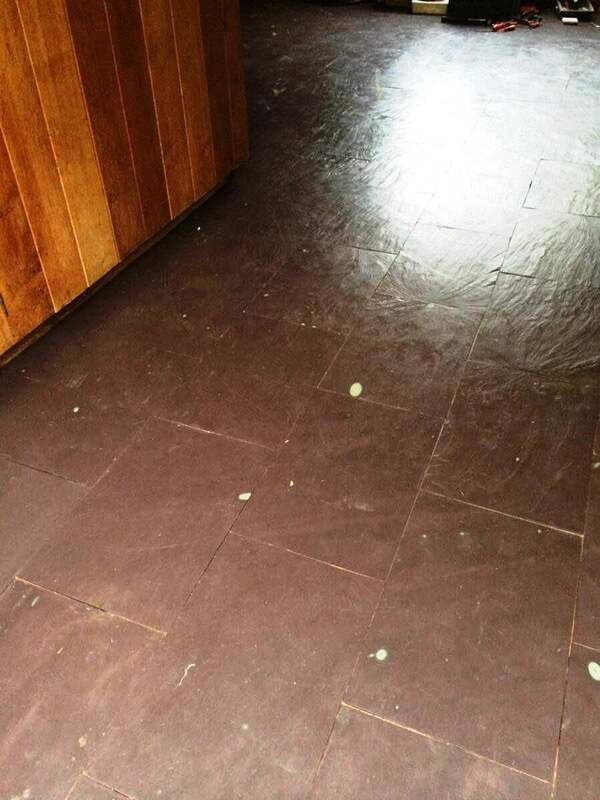 After this I rinsed the floor with water and extracted the now soiled cleaning solution with a wet vacuum. 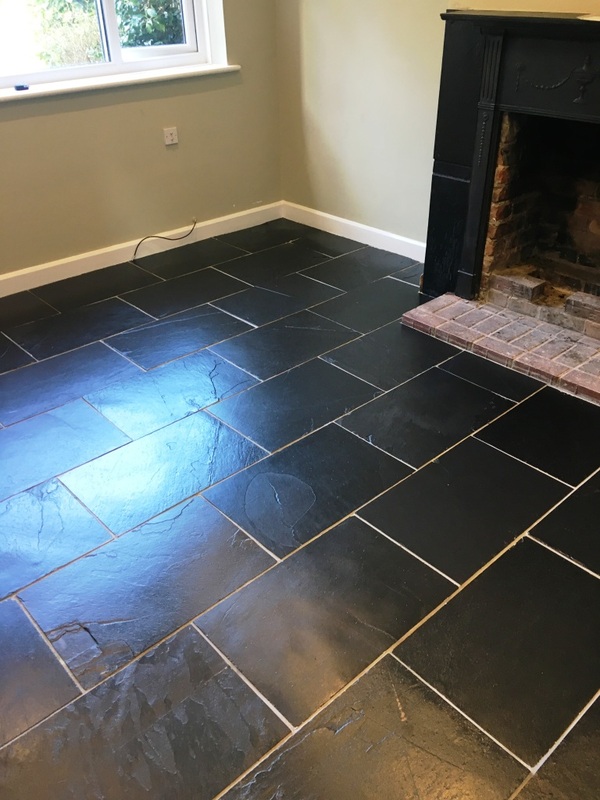 At this point it became apparent there were some stubborn stains in front of the oven that needed dealing with so I scrubbed in a solution of Tile Doctor Grout Clean-Up which is an acid based product that is great for removing mineral deposits such as salts as well as grout smears. 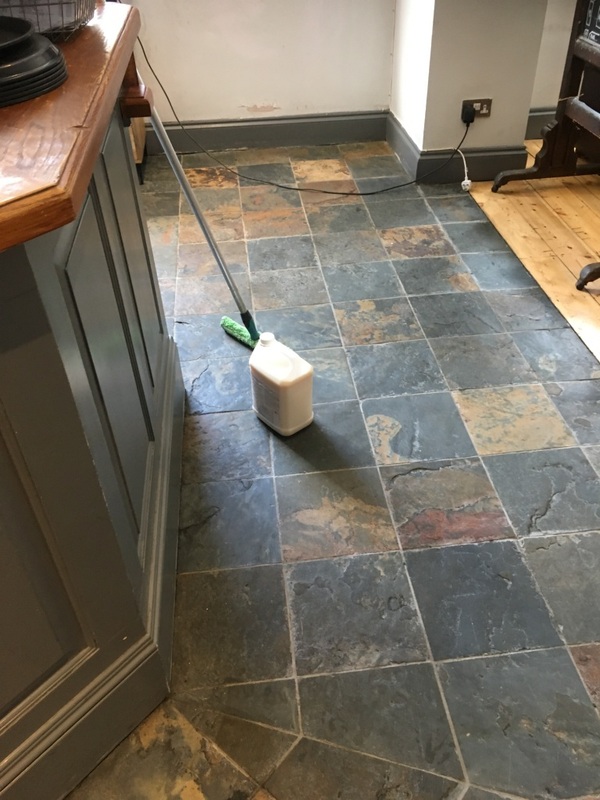 This worked well and the floor was now in ready for sealing so I gave the floor a good rinse to remove any trace of product and left it to dry. 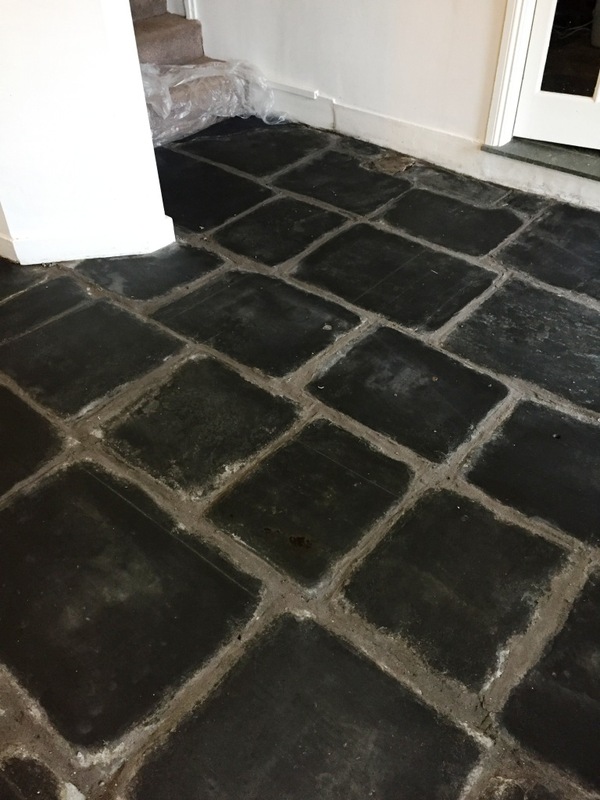 The floor was about 7 square meters in size and being relatively modern it had a Damp Proof Membrane and Underfloor Heating installed, as a result it was fully dry within three hours and ready to take a sealer. 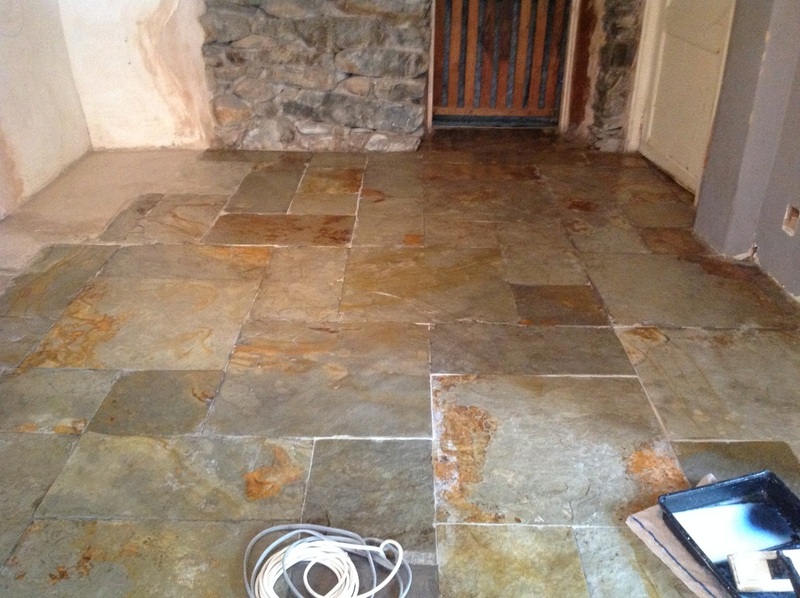 With the floor now dry I started applying the sealer which in this case was Tile Doctor Colour Grow. 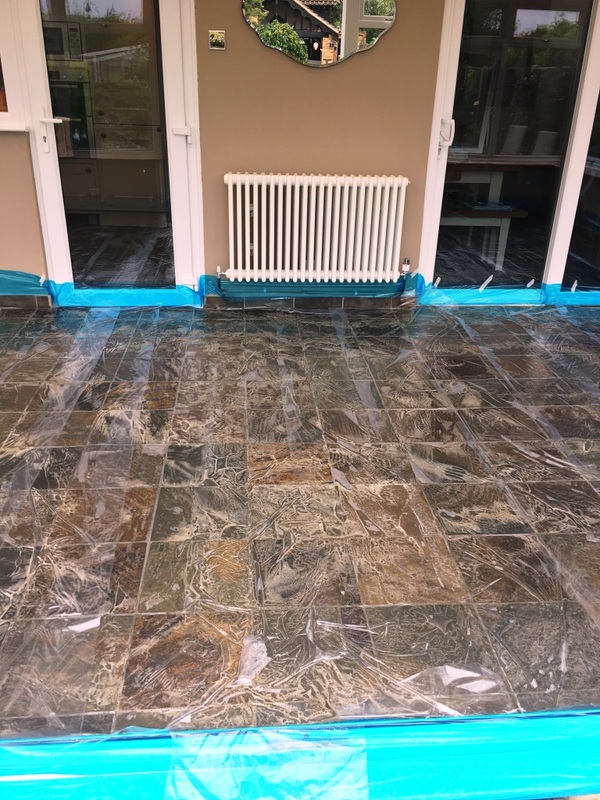 Colour Grow is an impregnating sealer that penetrates deep into the pores of the stone, thus acting as a shield against ingrained dirt whilst enhancing the natural colour of the tiles to provide an aesthetically appealing appearance. 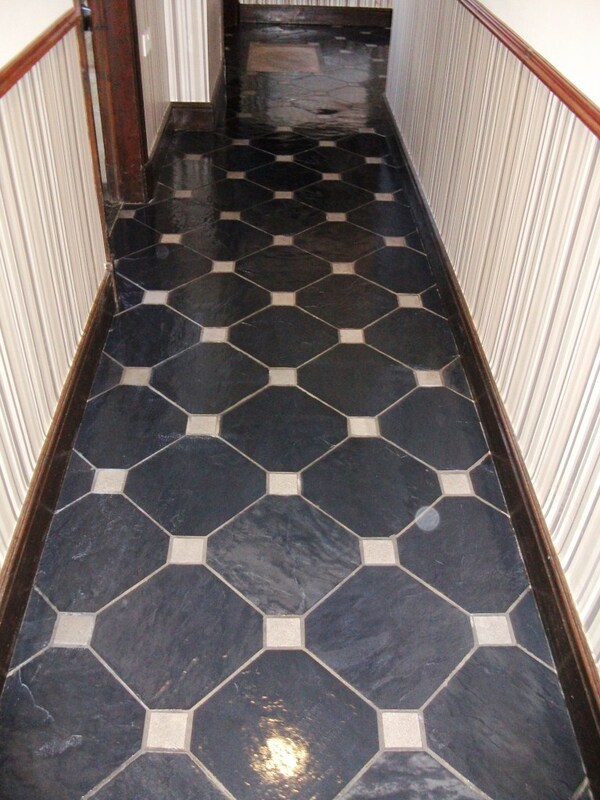 You may recall the owner had requested a matt finish so after applying a couple of coats the job was done. 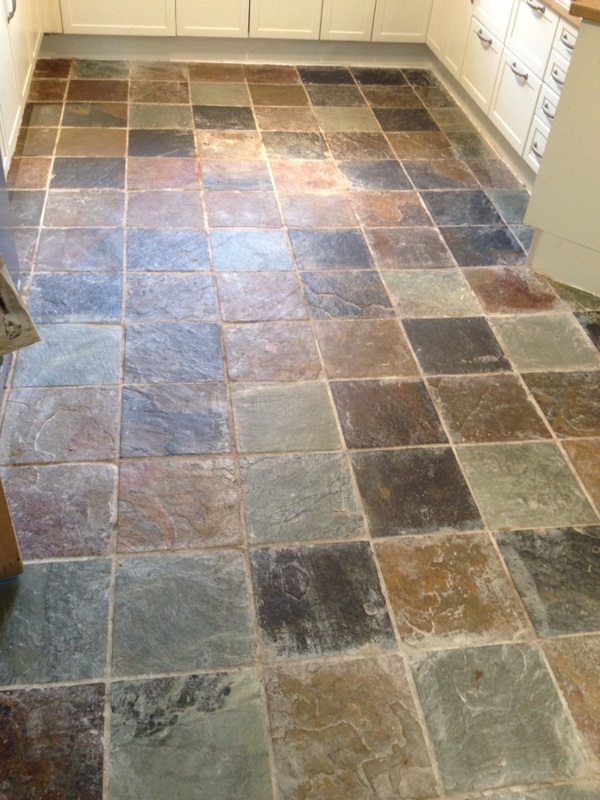 With the tiles clean and now protected with the colour enhancing matt sealer I asked the customer to inspect the floor. 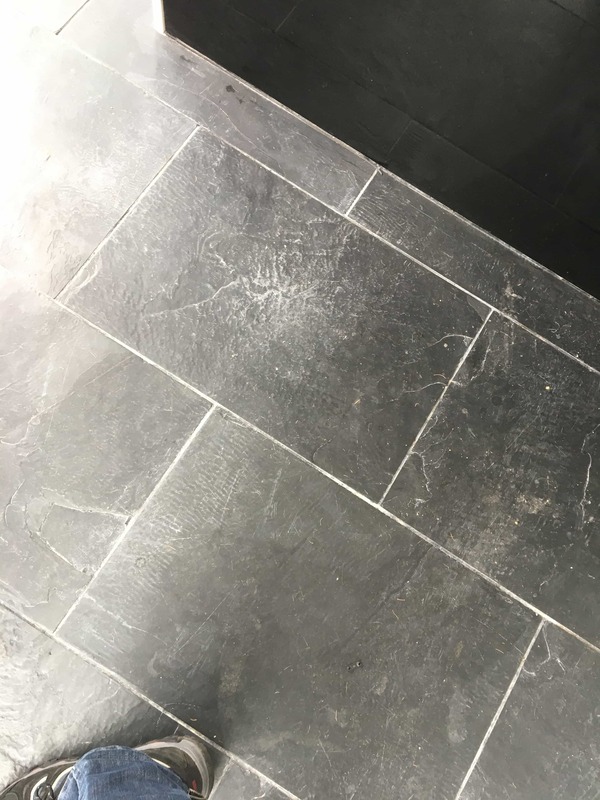 As you can imagine she was very pleased with the result and left the following comment on the Tile Doctor feedback system. 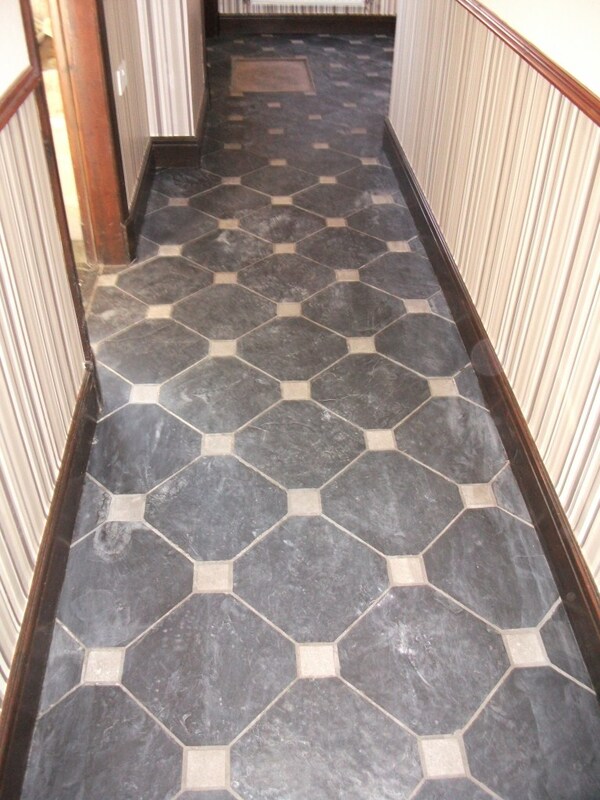 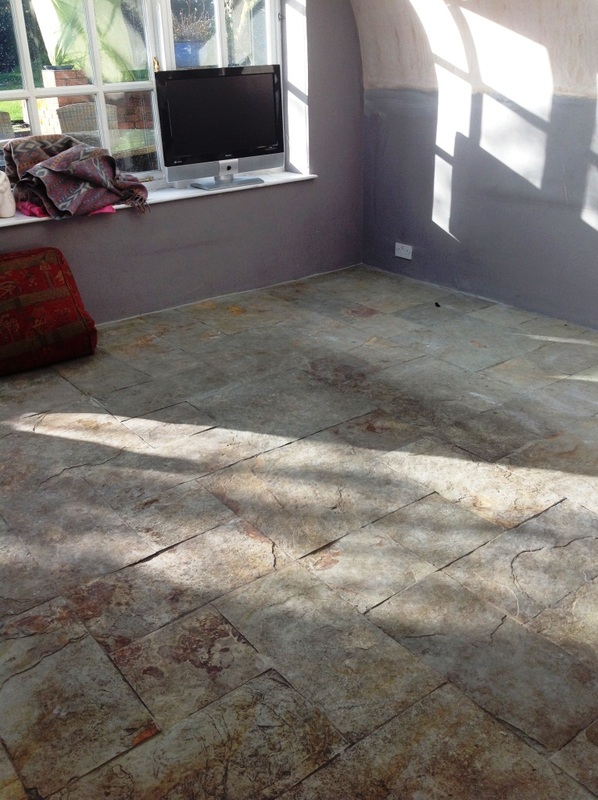 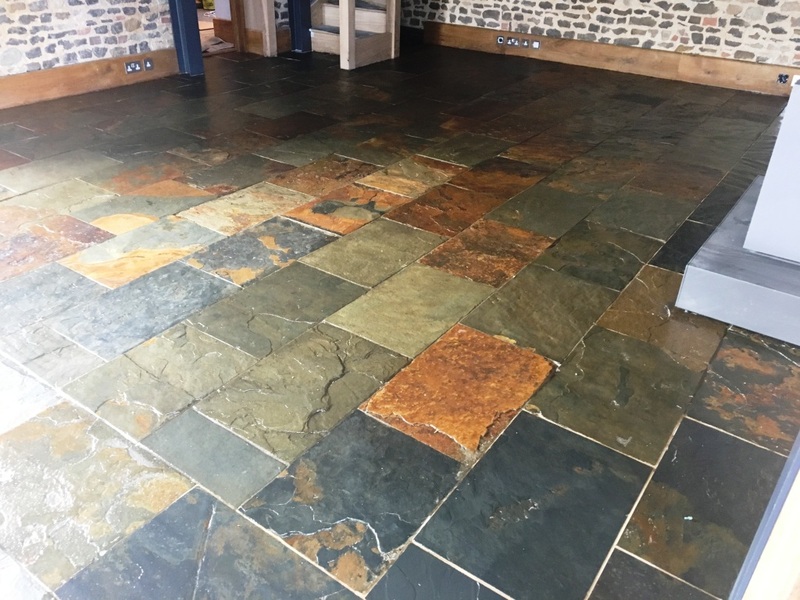 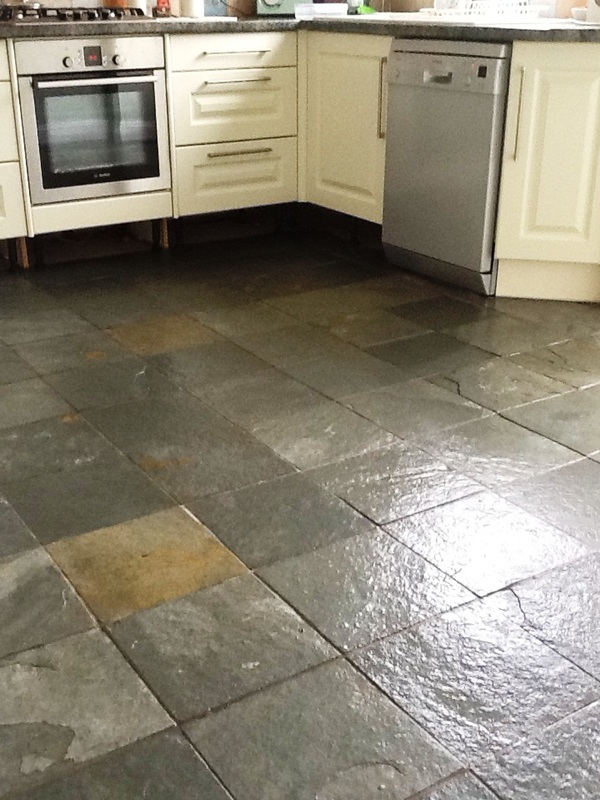 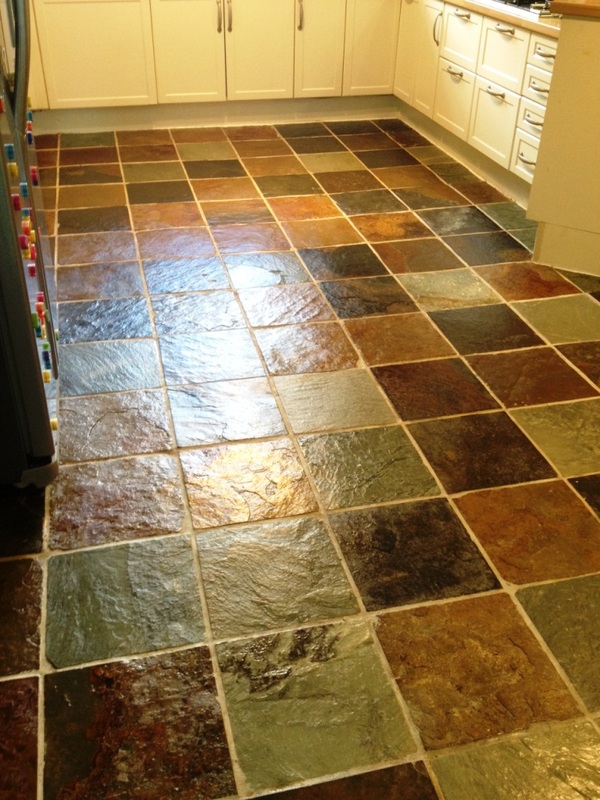 This Slate Tiled floor belongs to a client who had recently bought an old Oast House in Hastings. 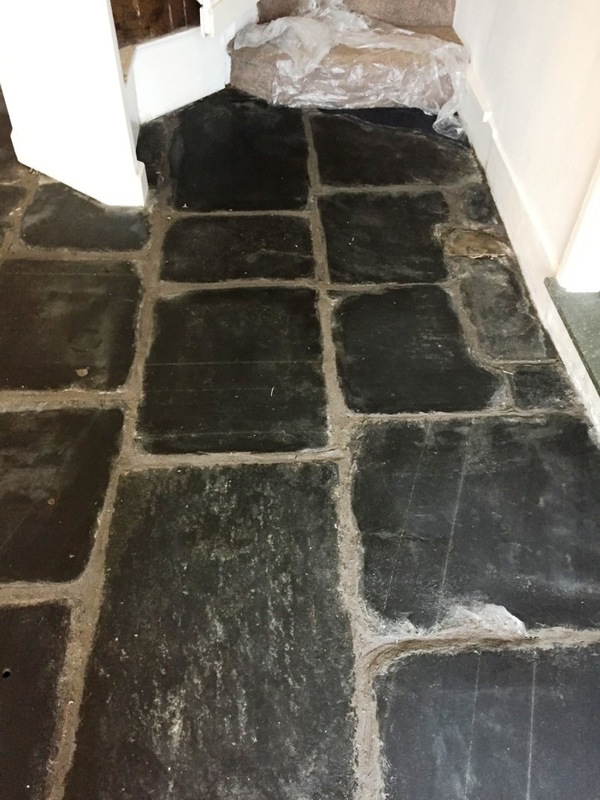 They were in the process of restoring it and when lifting up the floor discovered an original slate floor underneath it. 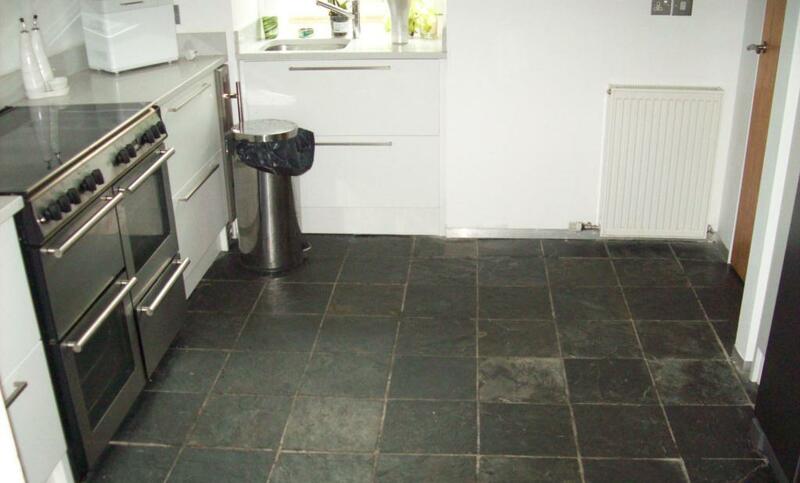 As the photos show it was in a very poor state and they were unsure whether to rip it up or see if it could be renovated. 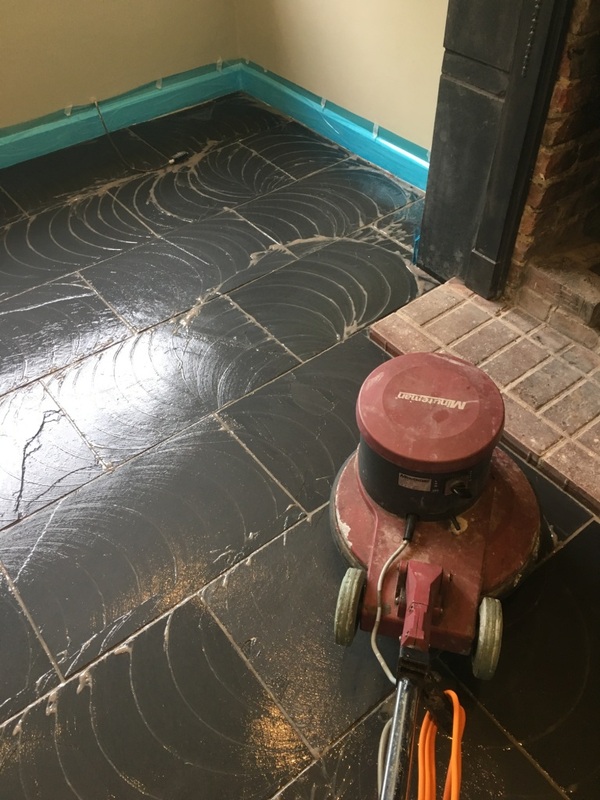 On my return I applied the same strong 3:1 dilution of Tile Doctor Pro-Clean to the floor that I used before letting it soak into the tile for ten minutes before using a stiff brush and large buffing machine fitted with a scrubbing pad to clean the entire floor Slate tiled floor. 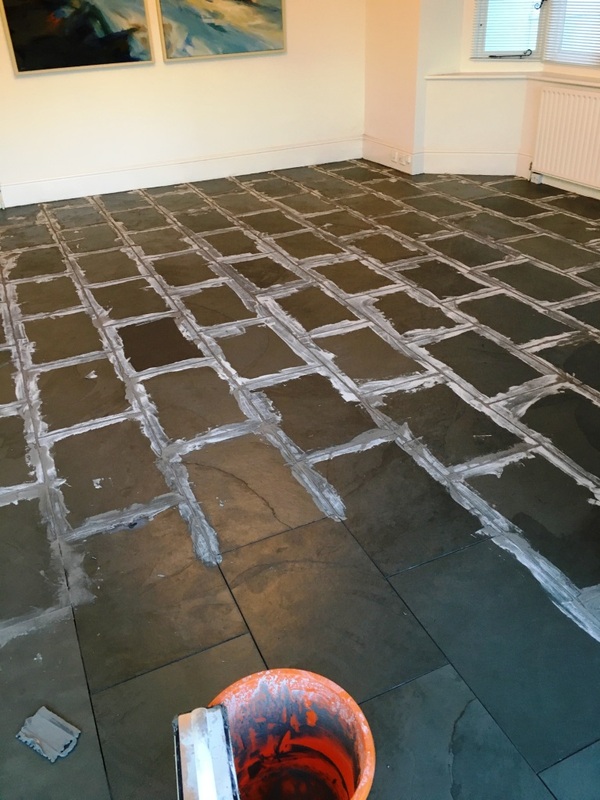 When finished I went over the floor again looking for stubborn areas and spot treating them until I was happy with the result. 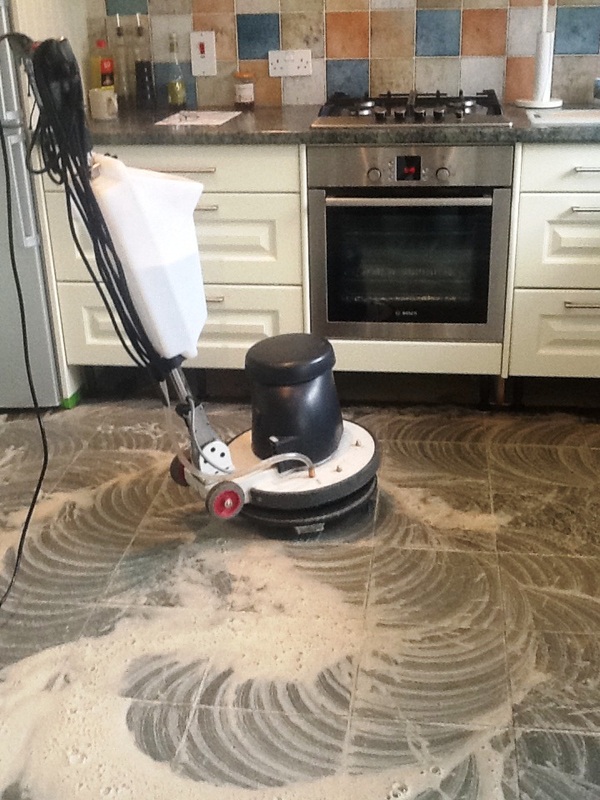 Once happy I gave the floor a good rinse using fresh water to remove any trace of cleaning product from the floor and using a wet vacuum to remove the fluids and get the tiles as dry as possible. 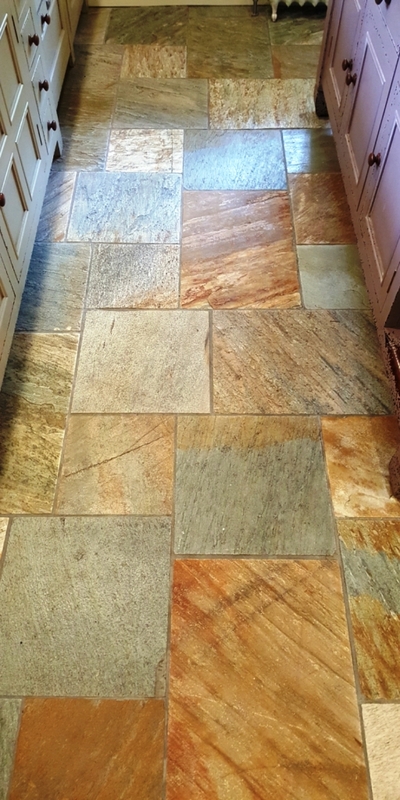 I left the floor for two days to allow time for it to completely dry out and returned to seal it using Tile Doctor Seal and Go. 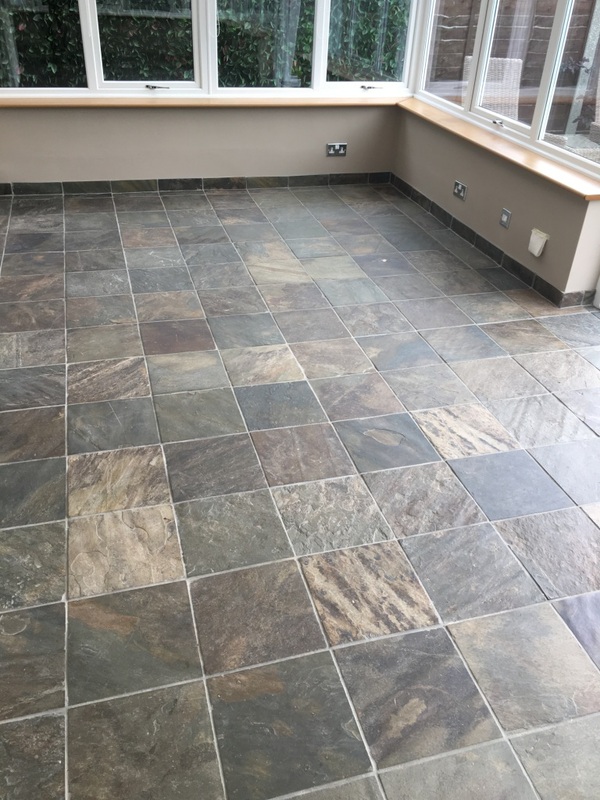 I applied four coats of sealer which gave the floor a fantastic finish and though the clients were initially weary of the shine I explained that it would dull down over a short period as it cured. 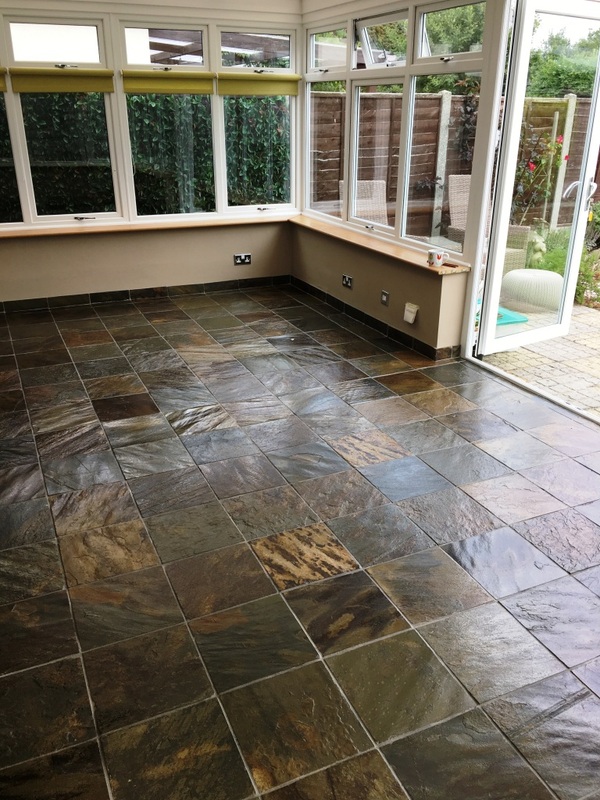 Before leaving I gave them advice on how to keep the tiles clean and recommended the use of Tile Doctor Neutral Tile Cleaner which is a neutral PH cleaner that will not reduce the integrity and longevity of the sealer; they were both very happy with the end result as was I as the difference after was striking. 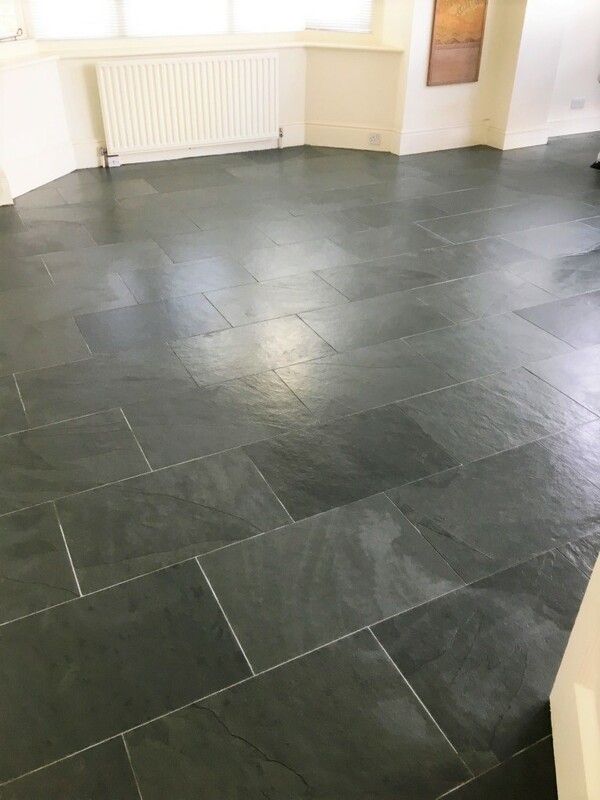 This property in Ulveston had previously been used as a guest house and was now being refurbished and turned back into a home. 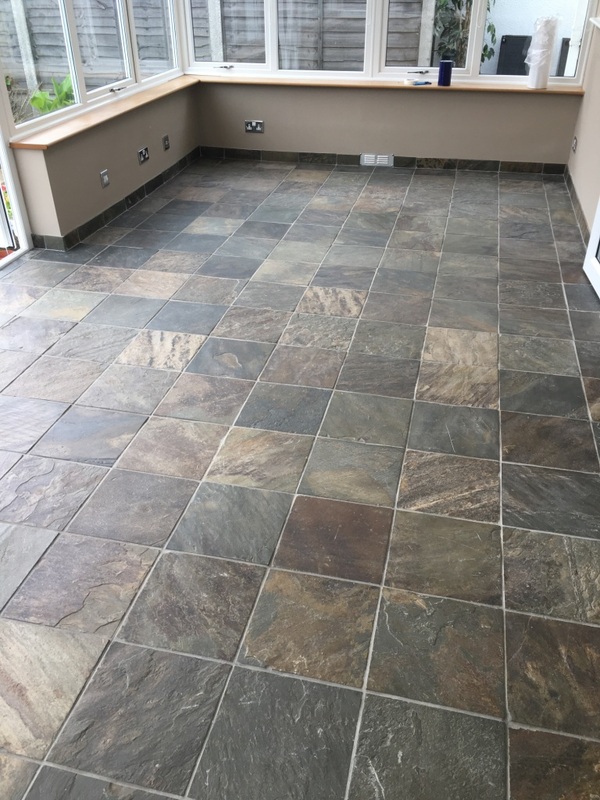 The kitchen and conservatory had a Slate tiled floor and as you can imagine had seen a fair amount of wear from the numerous fried breakfasts that had been prepared in there. 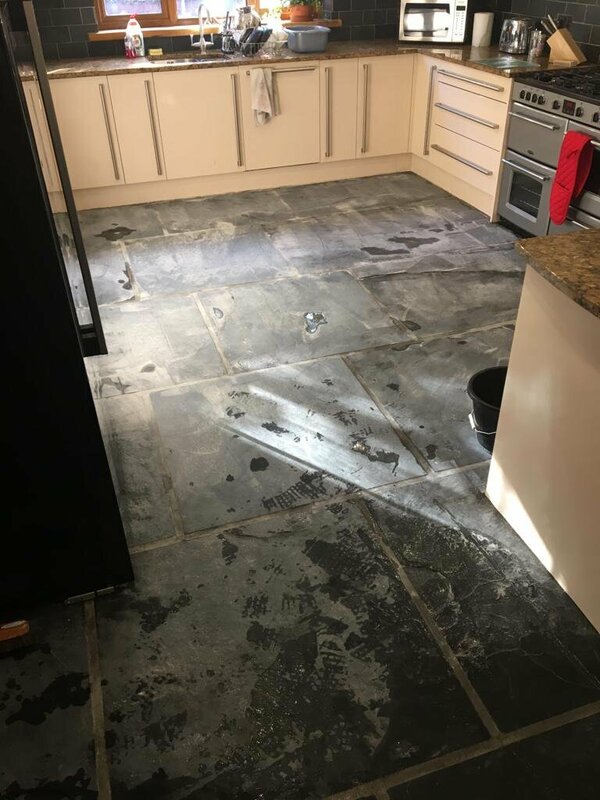 The owners had decided to replace the kitchen but were keen to keep the slate floor however it was in a bad state and looked as if it had never been cleaned and sealed for some time. 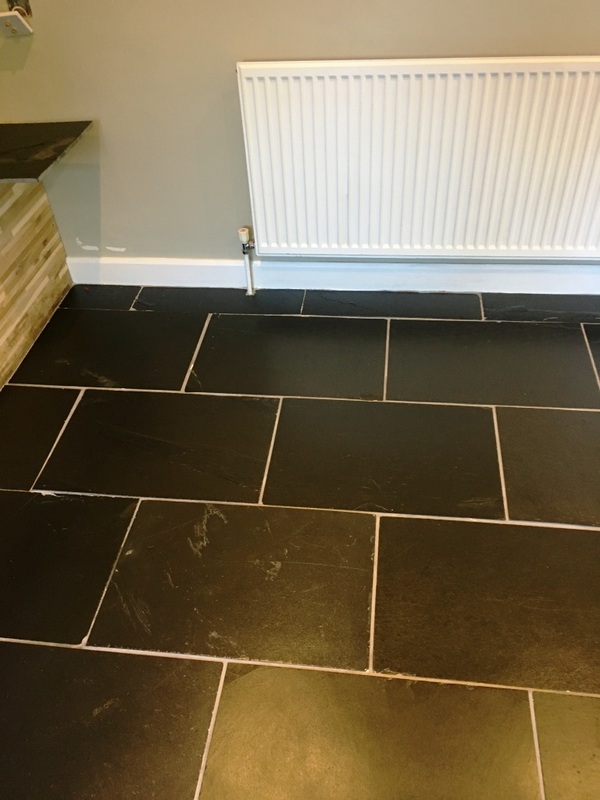 I did a small test using Tile Doctor Remove and Go (which you can see in the photograph below) and it came up really well, naturally we were booked to come back and finish the rest of the floor which I had estimated would take two days. 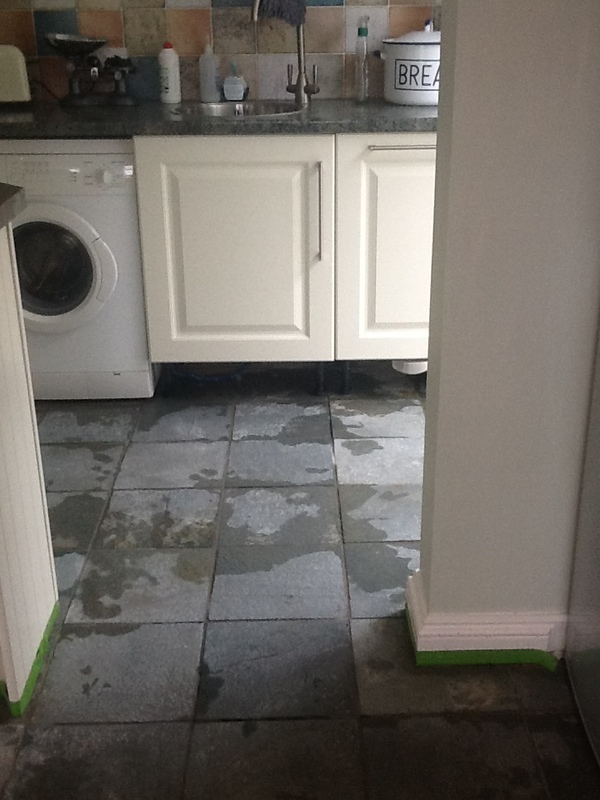 Two weeks later I turned up at 9am as agreed and set up my equipment, the kitchen had already been removed so with the exception on the cooker little preparation was required. 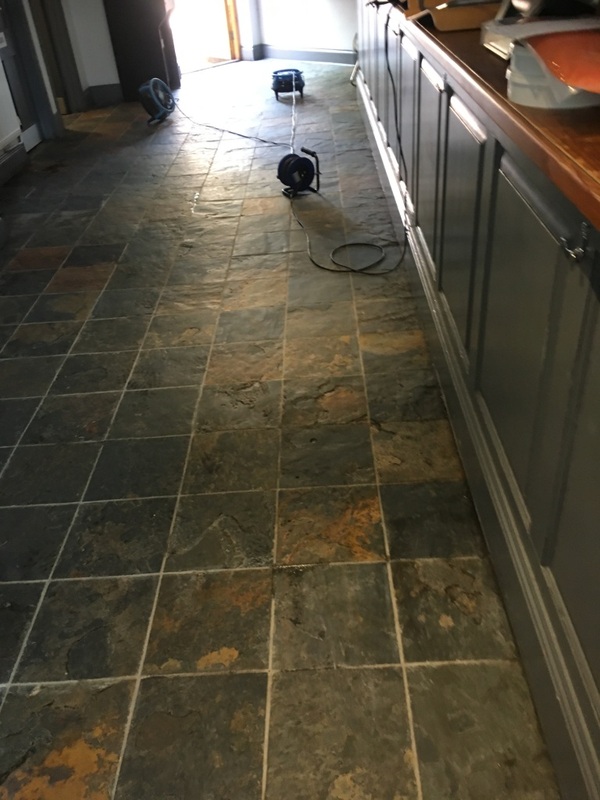 I worked in small areas using a high pressure spinner tool to remove as much dirt off the tiles as possible and a wet vacuum to remove the soiled water. 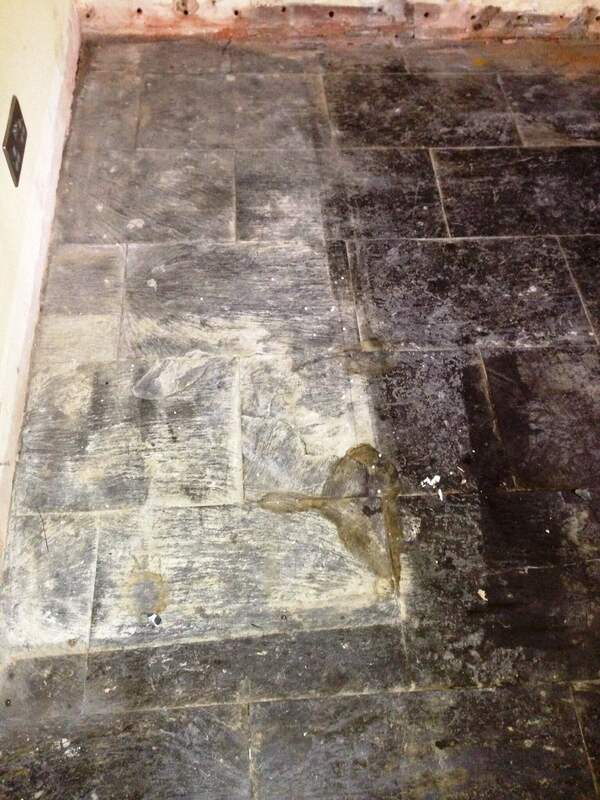 Stubborn areas were treated with Remove and Go and then I moved onto the next job which was to clean up the grout. 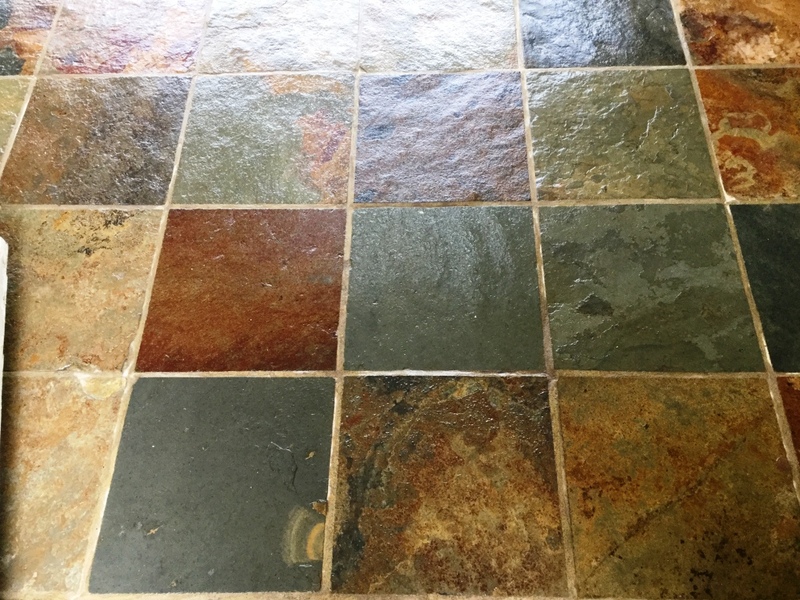 For this I used a strong dilution of Tile Doctor Pro-Clean which is a alkaline tile and grout cleaner that is safe to use on natural stone. 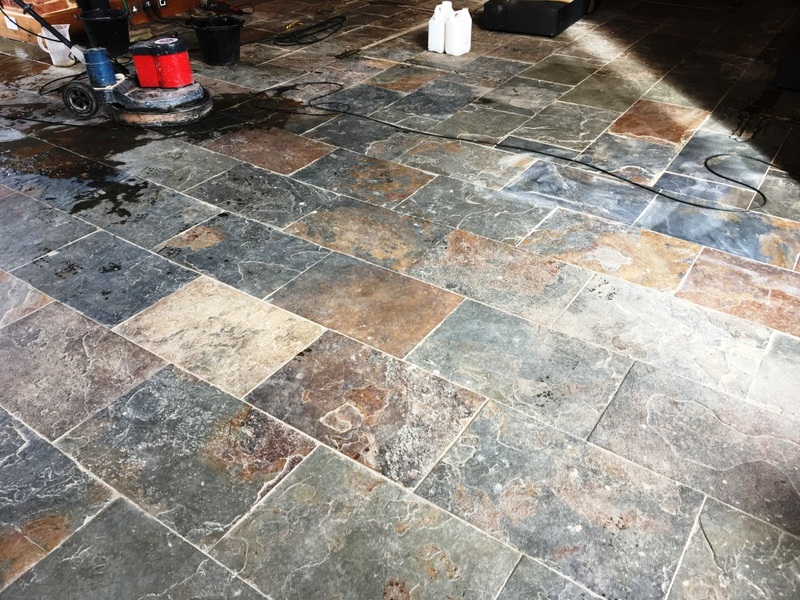 It was scrubbed in using a stiff brush and then rinsed off with clean water, again using the wet vacuum to remove the soiled solution. 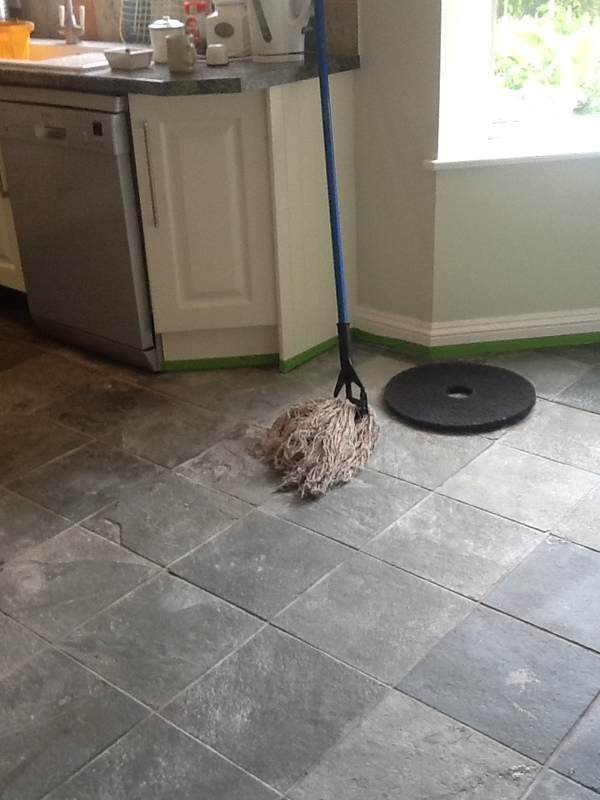 The floor was now clean but still damp so I tidied up my tools and left for the day. 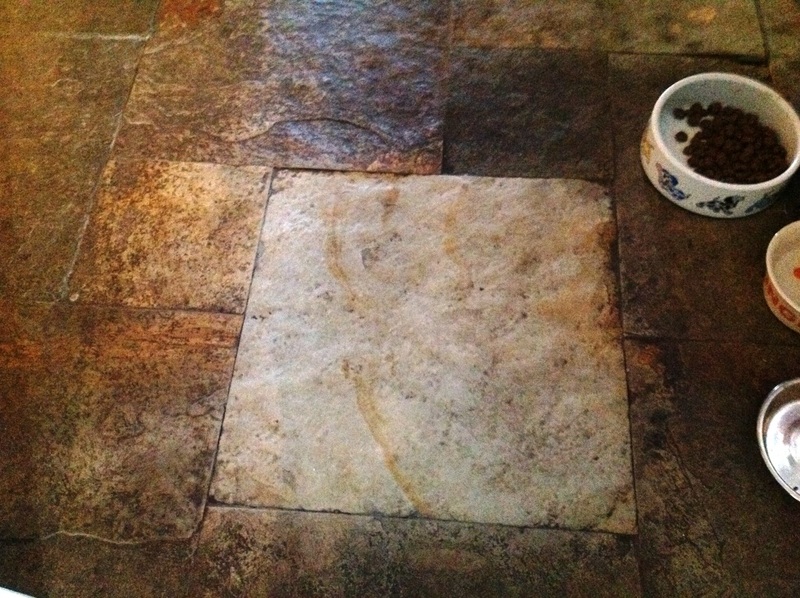 The Next day I came back and inspected the floor to ensure it was dry and that I hadn’t missed anything. 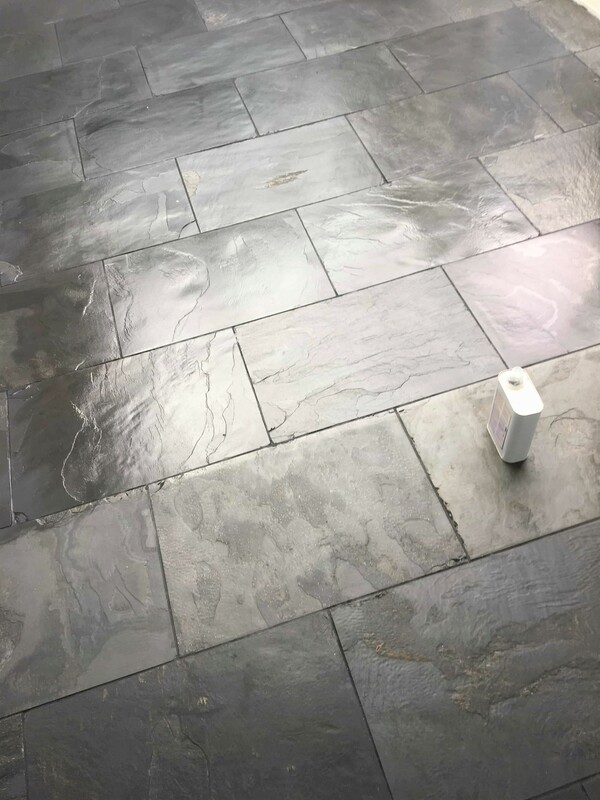 All was well so I started to seal the floor with five thin coats of Tile Doctor Seal and Go which is an ideal sealer for slate as it adds a nice subtle sheen to the tile and being water based there is no smell as it dries. 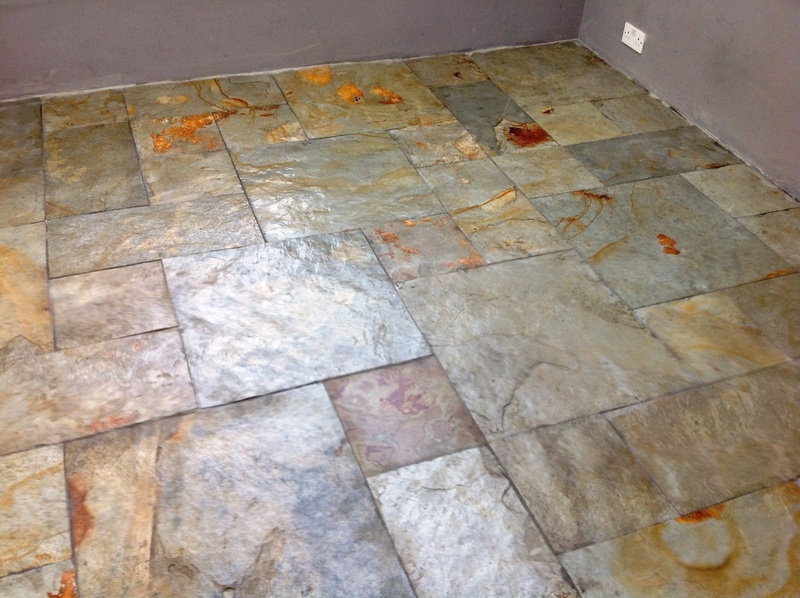 The sealer was applied using a paint pad applicator and each coat took around about twenty minutes to dry. 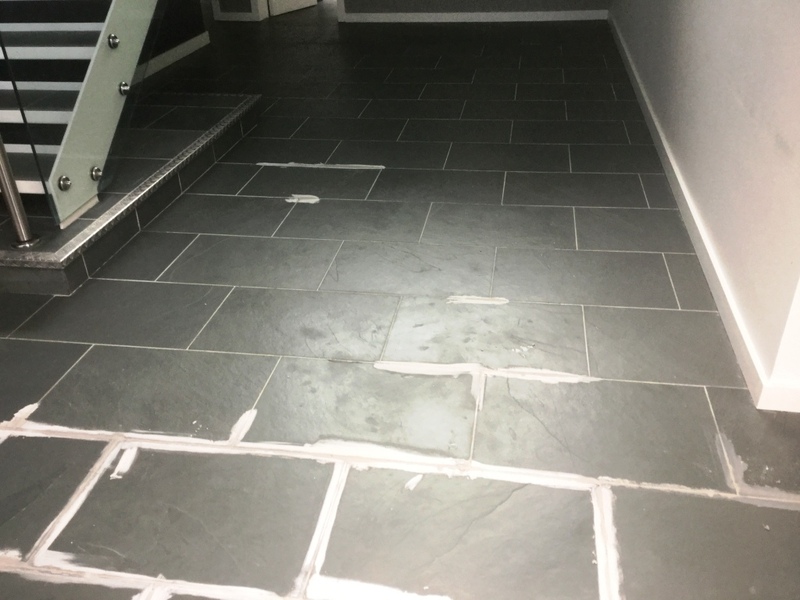 When it was complete and the floor had dried I packed up my equipment and spent some time talking to the customer to check they were happy with the results (they were very happy) and to advise them on how to maintain the floor using with a neutral tile cleaner going forward which will help extend the life of the sealer. 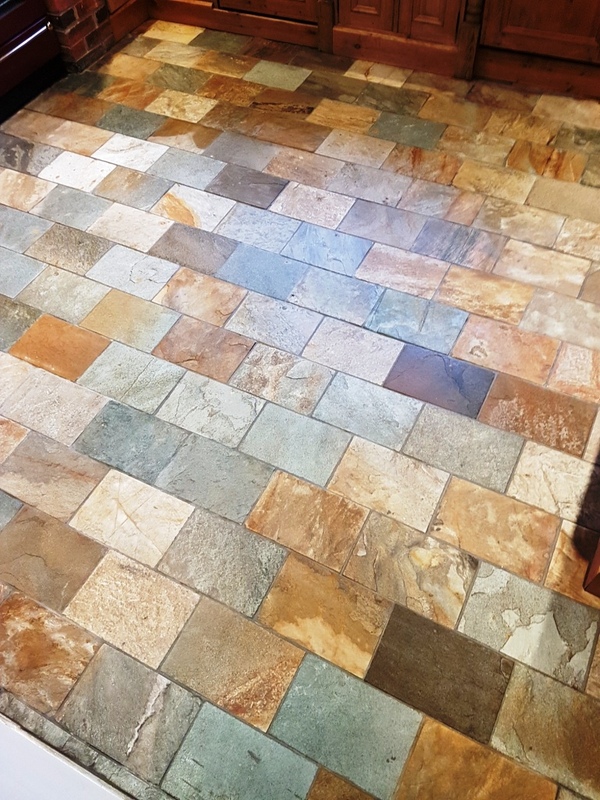 The remedy was to give the floor a good deep clean and then reseal so I got to work and applied a medium dilution of Tile Doctor Pro-Clean onto the floor leaving it to soak in for fifteen minutes before working it in with a black scrubbing pad fitted to a rotary buffing machine. 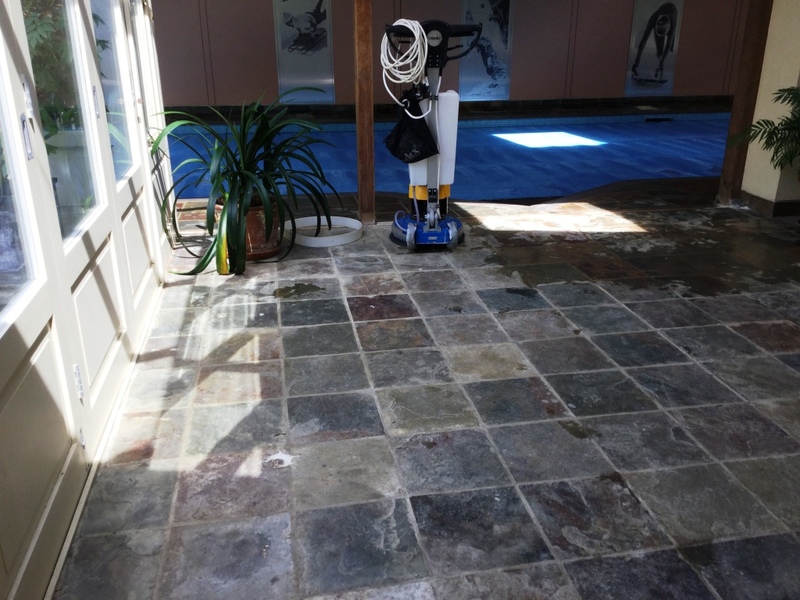 This process soon had the dirt running out of the floor and the soiled solution was removed using a wet vacuum. 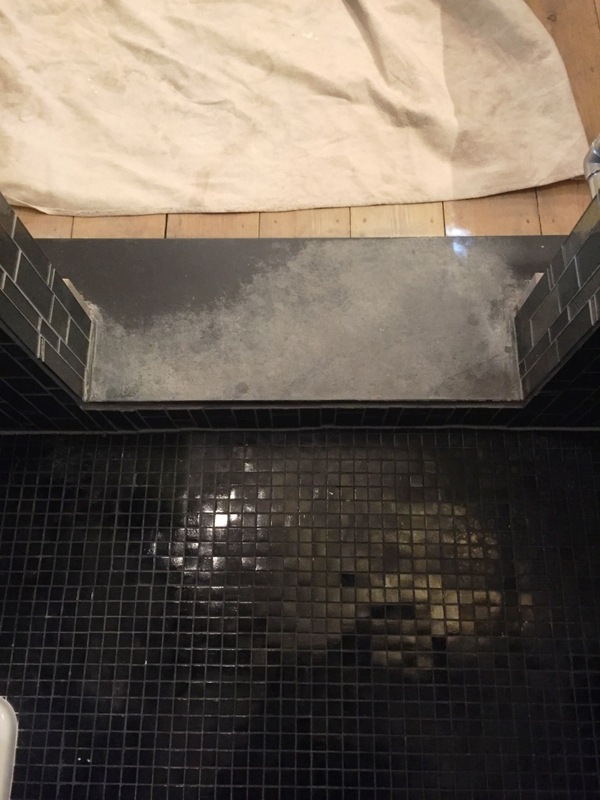 The process was repeated for stubborn area and this time the grout was scrubbed by hand using a stiff brush and more Pro-Clean. 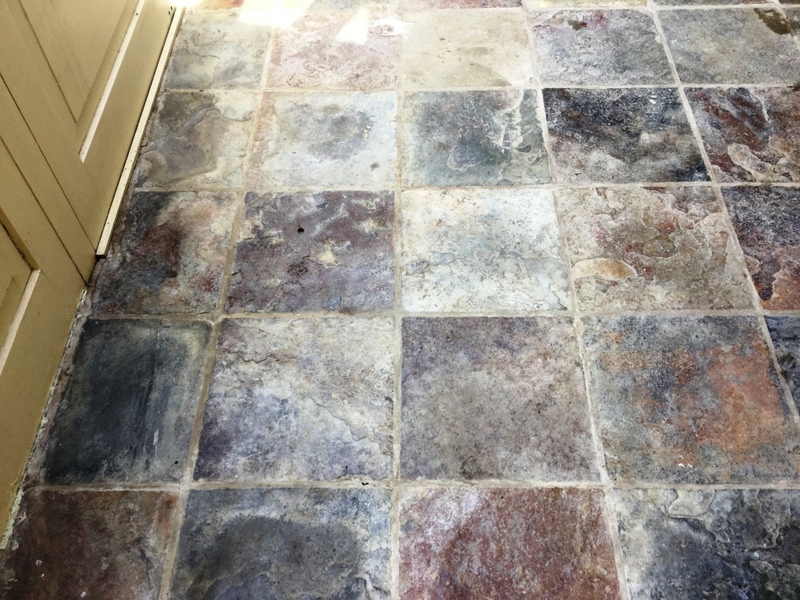 Pro-Clean is a multi-purpose alkaline based cleaning product that’s safe to use on Tile, Stone and Grout and given there was hardly any sealer left it wasn’t necessary to use a stronger dilution. 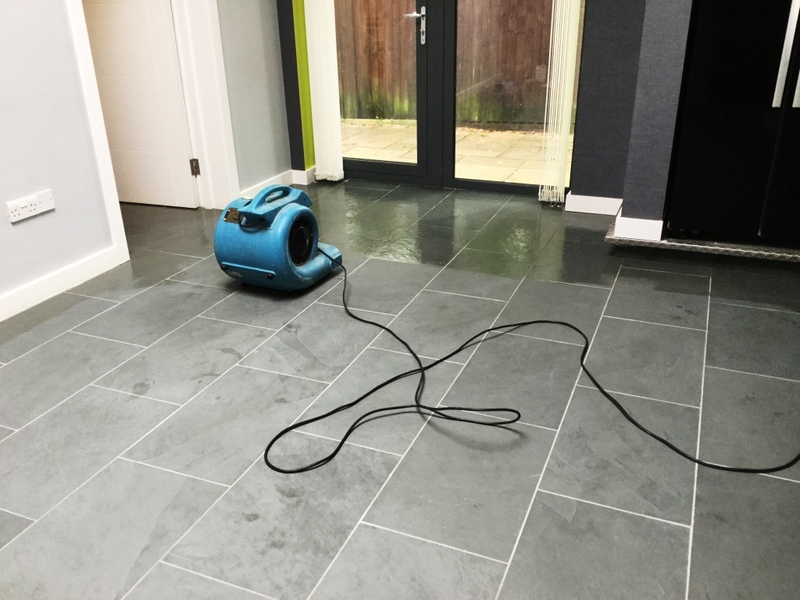 Once I was happy with the floor it was washed down with more water to remove any trace of cleaning products and then the water removed using the wet vacuum and then left to dry overnight.